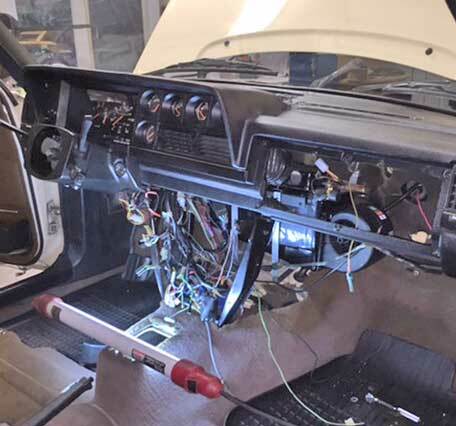 Getting satisfactory AC in an early 240 can be a real challenge. I sincerely believe the AC in these cars was designed with only northern European climate in mind. They were almost always a disappointment for U.S. owners in warm weather. Older 240s ( pre-1991) with AC were just not up to the task. <<< Later 240s made from 1991 to 1993 got a more modern system that can be recognized by the big silver aluminum accumulator near the right side firewall. These systems were a different design. They incorporated an orifice tube rather than a thermal expansion valve (TXV) found on earlier systems. The evaporator box under the dash was a different design as well and reportedly had a more efficient evaporator. From 1991-92 the system retained R12a refrigerant as in previous years. 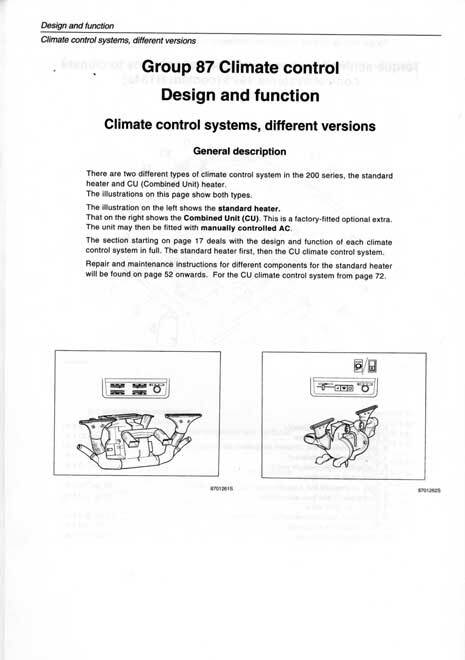 The 1993 models were changed to use R134a refrigerant. A few other components (sensors) were changed to accommodate the new refrigerant. 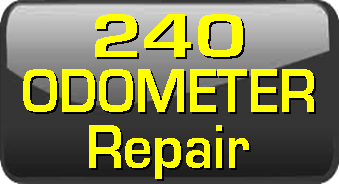 More general information about 240 AC systems can be found in the next section below. If you want to learn more about 240 AC systems, then this information will help. 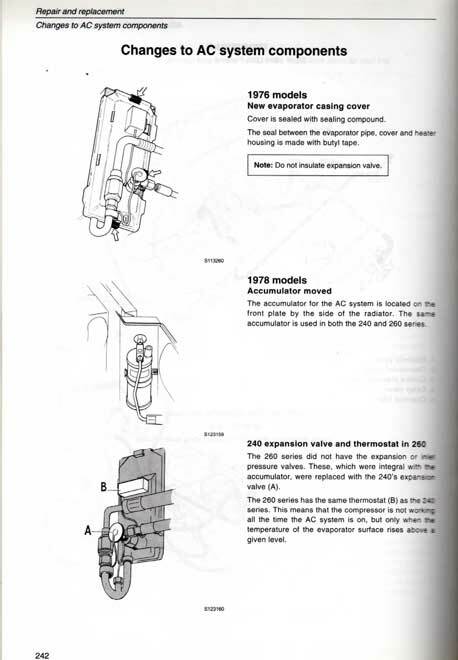 <<< (PDF 2 mb) This is an excerpt from a Volvo 240 AC Greenbook. 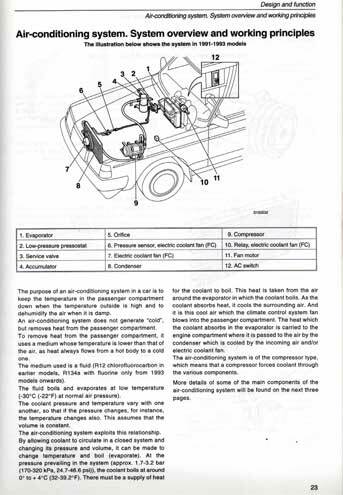 It offers an explanation of the heater and AC systems offered in 240 models from 1975-1990. NOTE: The Standard Unit or Standard Heater was an AC delete system available only in countries OTHER than USA or Canada. 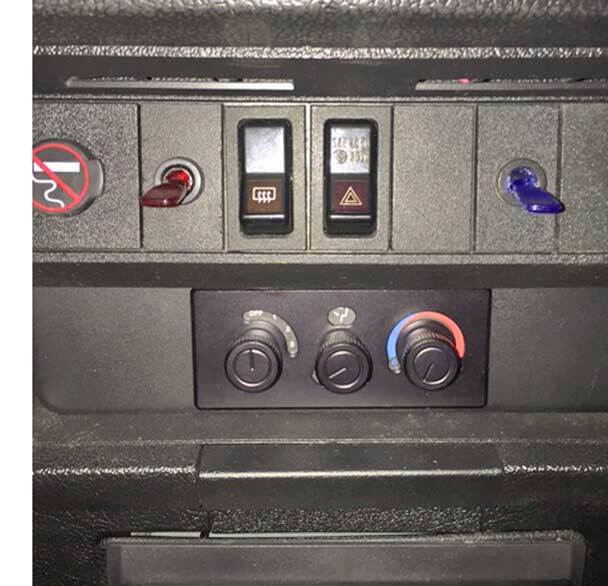 The Combined Unit (heater and AC combined) was the type of system normally offered in all cars imported to USA and Canada. All AC systems from 1975-1990 used R12a refrigerant and a Thermal Expansion Valve (TXV) to control and release pressurized refrigerant into the evaporator. 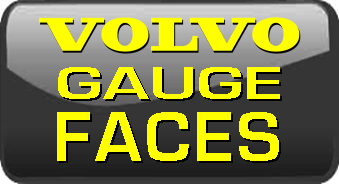 <<< (PDF 1.5 mb) Here's another excerpt from the Volvo 240 AC Greenbook. It offers an explanation of the CHANGES in 240/260 AC systems over a 15 year period from 1975-1990. 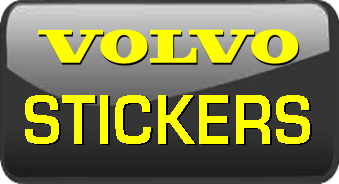 <<< (PDF 1.2 mb) Here's another excerpt from the Volvo 240 AC Greenbook. It offers an OVERVIEW of 240 AC systems (using orifice tubes) for later models offered in 1991-1993. <<< These later 240s got a more modern system that can be recognized by the big silver aluminum accumulator near the right side firewall. It incorporated an orifice tube rather than a thermal expansion valve (TXV) found on earlier systems. 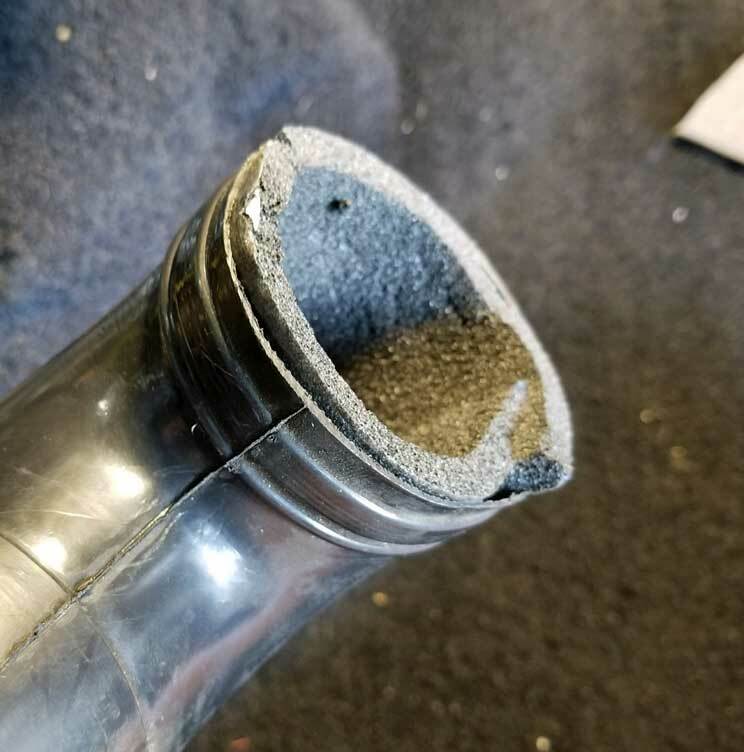 An orifice tube performs the same function of controlling and releasing pressurized refrigerant into the evaporator under the dash. From 1991-92 this system used R12a refrigerant. 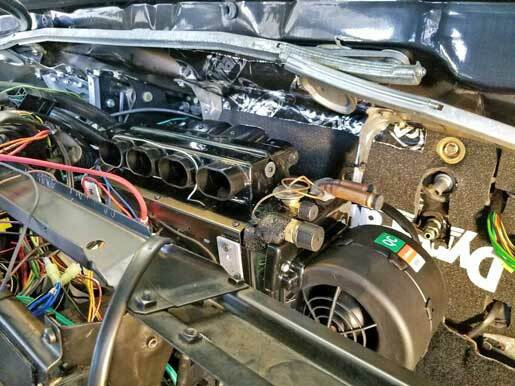 The 1993 models were changed to R134a refrigerant and some components were changed (orifice tube, sensors, service valves, condenser) to accommodate the new refrigerant. 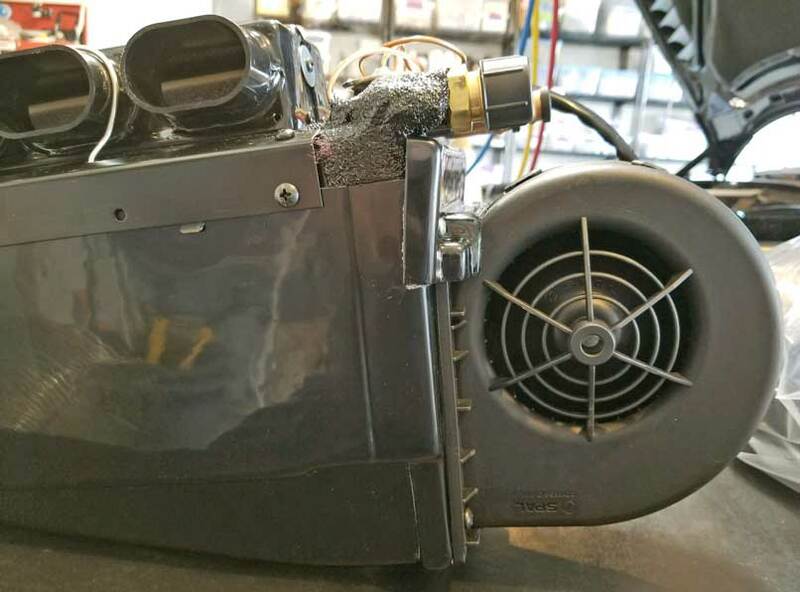 Also, 1993 models received compressors with a temperature switch, which is designed to cut power if the compressor overheats (typically due to a leak). I get a lot of questions about later 240 systems like this. I don't have all the answers, but I know one of the most misunderstood things are the pressure switches (sensors). There are TWO pressure switches in this later system. 1. One pressure switch is mounted in the accumulator/drier. 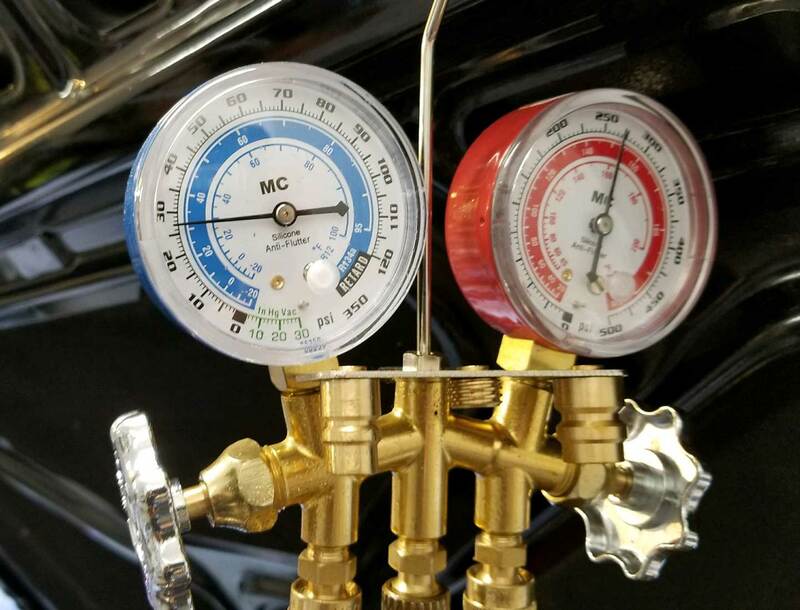 It's a low pressure switch (or pressostat) that that is designed to sense internal refrigerant pressure in the evaporator. 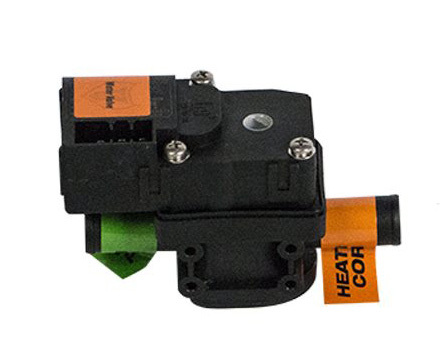 This switch is designed to cut power to the compressor when pressure in the evaporator drops below 23.2 PSI (for R134a) or below 26.1 PSI (for R12). It then allows the compressor to come back on when pressure in the evaporator exceeds 44.9 PSI (for R134a) or exceeds 46.4 PSI (for R12). 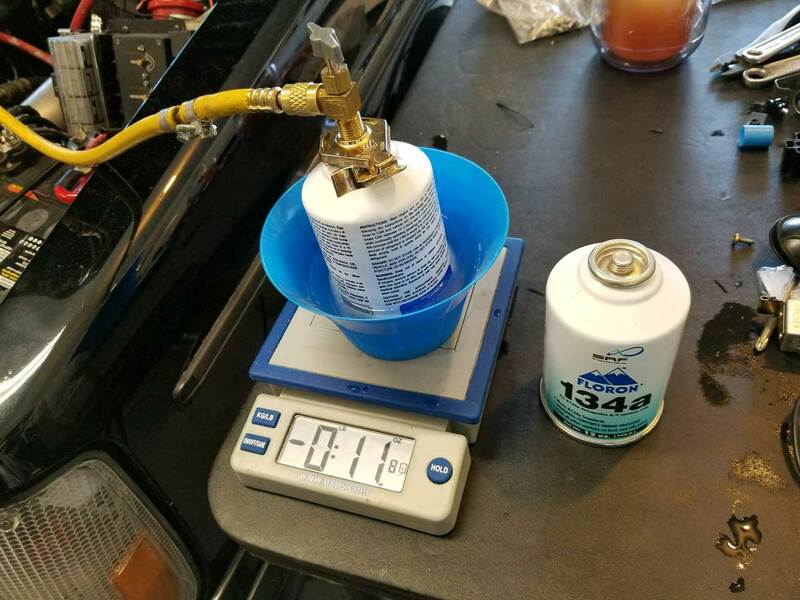 It does this because when pressure in the evaporator drops below 23 PSI, the evaporator can get cold enough to freeze the coils and any moisture or humidity will begin to form ice. 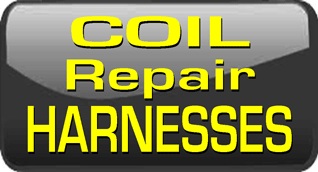 A freezing evaporator coil may sound like a GOOD thing, but when it gets TOO cold it freezes up and ice will block air flow through it. This will cause failed AC cooling. 2. The other switch is a sensor in the high-pressure line coming from the condenser. It's a high pressure switch which activates the condenser fan ON when pressure increases over a certain level. Fan comes ON at 245 psi and back OFF after it drops below 188 psi. Excessive Pressure Safety Valves: Contrary to what many people think, there is NOT an electronic high pressure switch in this system that guards against over-pressure situations. These systems all use a mechanical pressure relief valve on the compressor to vent gas in the event of an over-pressure situation. Depending on the manufacturer of the compressor, this "safety" valve will release pressure if it exceeds 31 to 37 bar (450 to 536 psi). USING PROPANE AS A REFRIGERANT??? Over the years I have done a lot of experiments on my 1984 242 AC. Some have responded fairly well, but none would work like a real modern AC system is supposed to. Beginning in 2010 I made a serious attempt at using PROPANE as a refrigerant after a suggestion by another 240 owner I knew who had been successful. My success with propane was limited to some decent cooling on the highway (most of the time), but there were always problems during idle when the cooling would gradually taper off and go away. It was frustrating. Other times there were also suspected problems with things freezing up from getting too cold, which caused more temporary failures. This may have contributed to the failures at idle, but I could never confirm it. During this time I did have success with helping a friend convert a totally stock '84 240 GL to propane AC. That car worked well for many years at idle and on the highway. So it appears that some cars respond better than others. My '84 242 Turbo did not respond to propane as well as I had hoped. In 2012 gave up on propane and moved to Duracool R12 replacement http://www.duracool.com/. It seemed to be more consistent than propane and freeze ups were eliminated. I tried a number of different thermal expansion valves and a LARGE number of different expansion valve settings for my 240. I got pretty good cooling on the highway, but I still found problems at idle (although it seemed a little better). I kept experimenting over the years with many different expansion valves and a huge variety of different adjustment settings on those valves. Things never got any better and I remained unsatisfied in my AC. Over the years, whenever I would come across custom hot rods at car shows with custom retrofitted AC systems from Classic Auto Air or Vintage Air, I became very interested in the results and I would interrogate the owners about how well they worked. I'm a SKEPTIC by nature and I remember the old JC Whitney catalogs many years ago, which had cheap looking under-dash AC systems. JC Whitney did not have a reputation for high quality stuff and I never actually tried any of their AC systems. So my past skepticism tended to polute any confidence I might develop in aftermarket AC systems. The answers I got, however, from every one of those hot rod owners about their Classic Auto Air or Vintage Air systems were very positive. So after Michael Yount successfully installed his system in his 240 (below), I paid attention and started seriously re-considering. 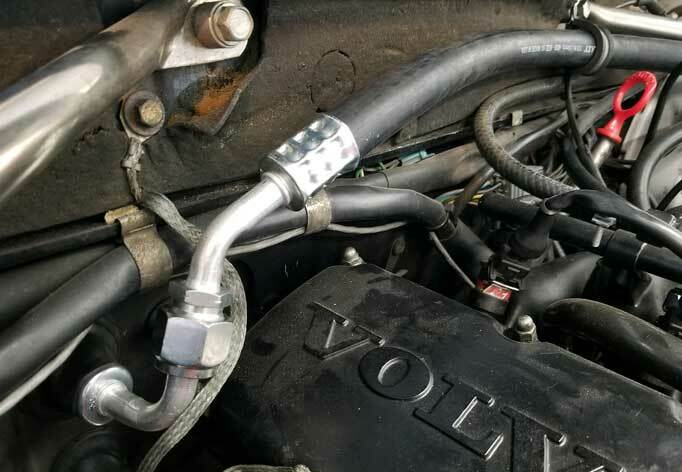 If you have done Volvo AC upgrades or if you're thinking of doing something like this, please email me. I'd like to hear about it. This is what began my conversion from skepticism to a belief that real 240 AC was possible. 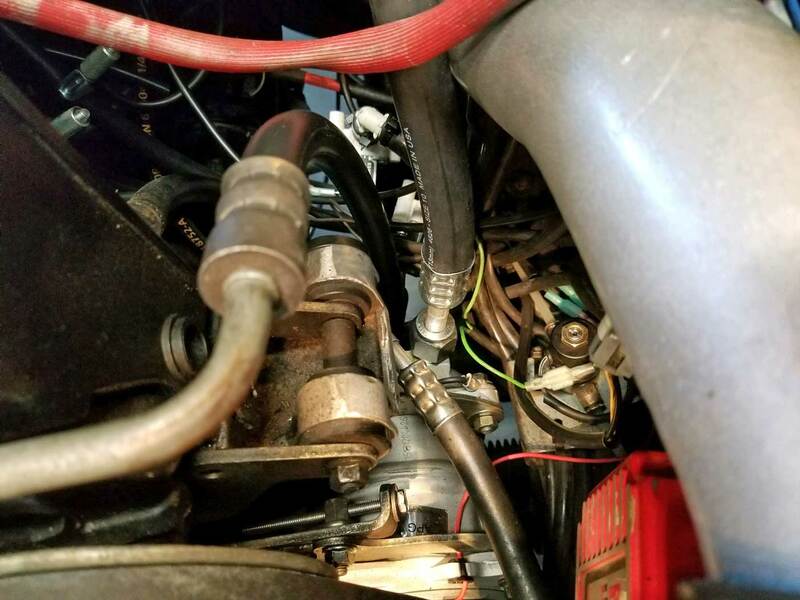 <<< In 2016 I learned that 240 owner Michael Yount of North Carolina had fitted a Classic Auto Air system in his LS3 equipped 1982 240. His car has been featured in my Favorite 240 Page: https://www.240turbo.com/volvo240.html. Michael reported exceptional results with 36 degree vent temps at idle on 90 degree highly humid days. His success was enough to inspire me to make future plans for a similar installation. I don't think I would have ever considered such an installation if Michael hadn't done it first and I would have stayed in Volvo AC hell. 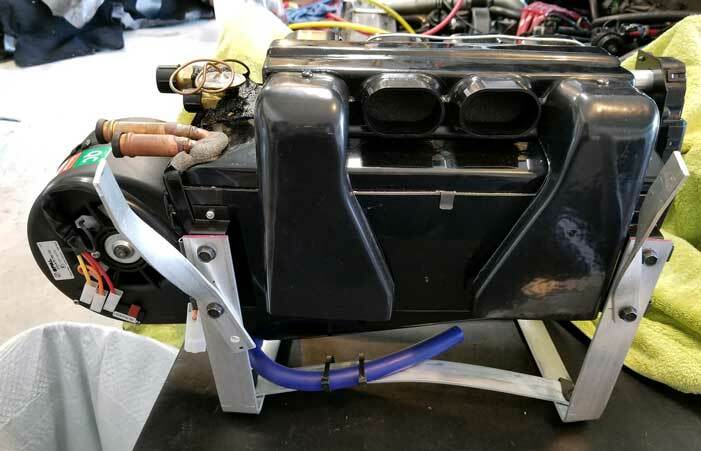 <<< This AC box is the Street Rod Cooler III from Classic Auto Air. 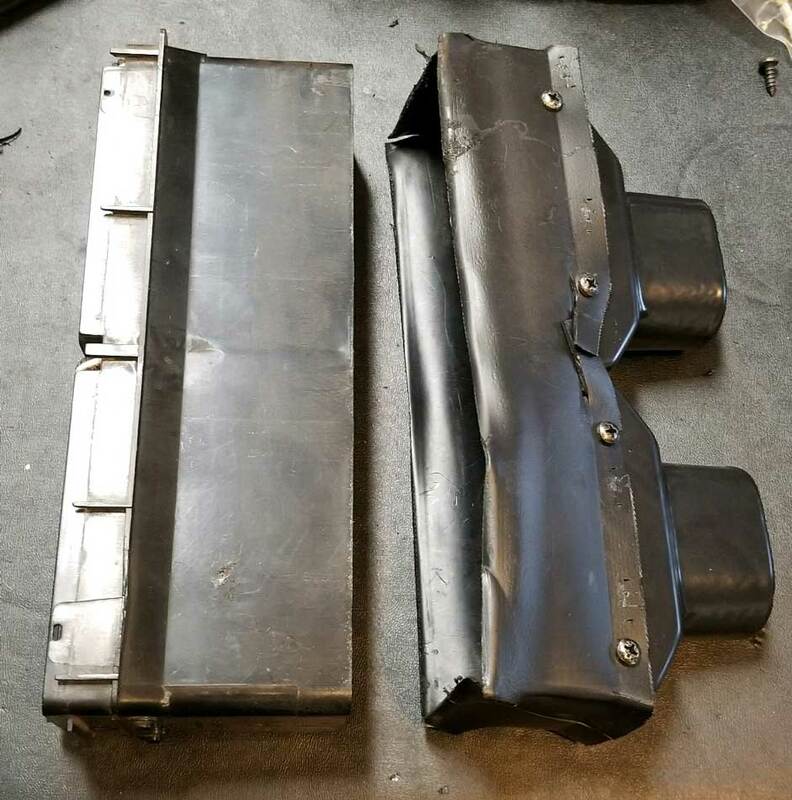 The shape of the aftermarket AC box is very different from the original 240 AC box. 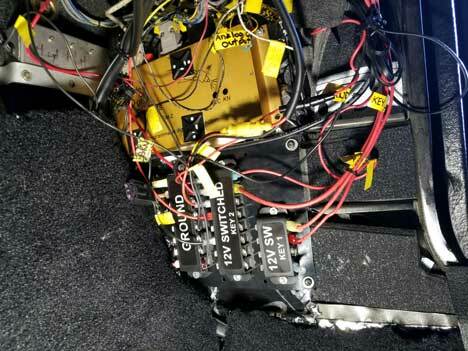 In this photo, you can see that Michael has added some of his own metal bracketry for mounting the new box under his dash. Also the sheet metal brackets at the very top are the same brackets in your 240 that hold the original AC box in the car just under the windshield cowl. Classic Auto Air has several versions and sizes of AC boxes. This is one of their all electronic boxes. 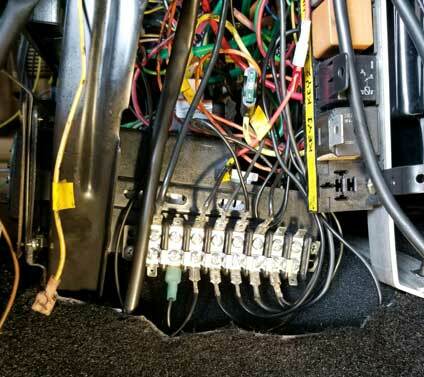 An electronic box like this one eliminates the cable and vacuum controls originally found in a 240. 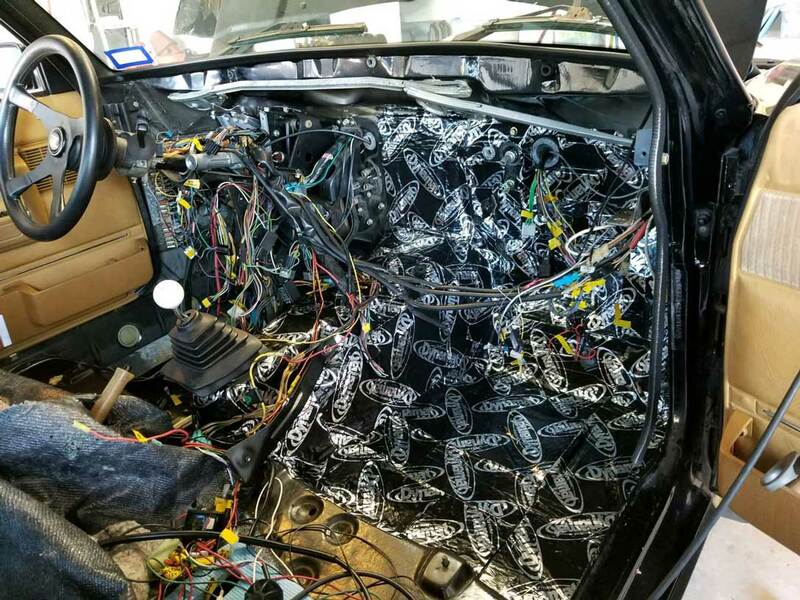 So this means your 240 vents and temp controls are done electronically and all those original vacuum buttons and cable controls go away. 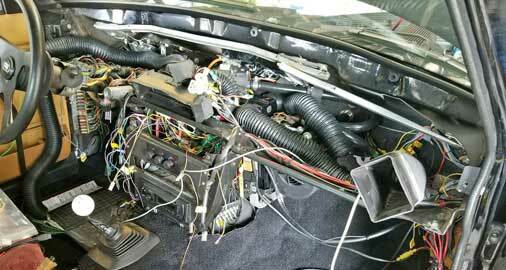 <<< With the old airbox area gutted, here's a view of Michael's car with the new AC box sitting under the dash. The design of this Classic Auto Air box is more compact than the original Volvo box, however it's WIDER than the original Volvo box. 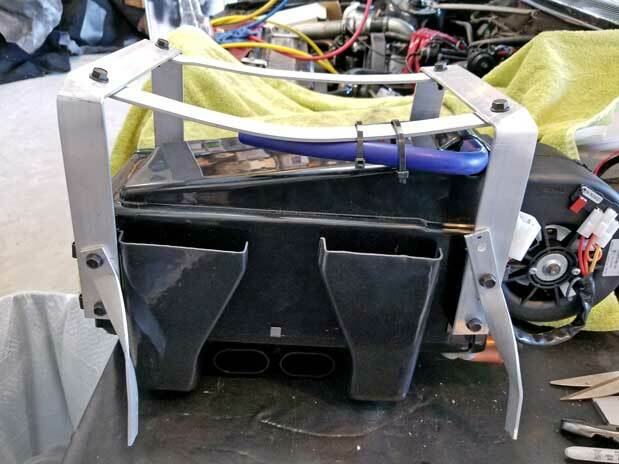 <<< Here's a front view of the new air box in Michael's dash. There are some compromises or trade-offs with this system. <<< As you can see in these pics, the new AC box is a bit wider than an original 240 box, so part of it can be seen extending into the passenger footwell. This is a small trade-off that I would be willing to accept. 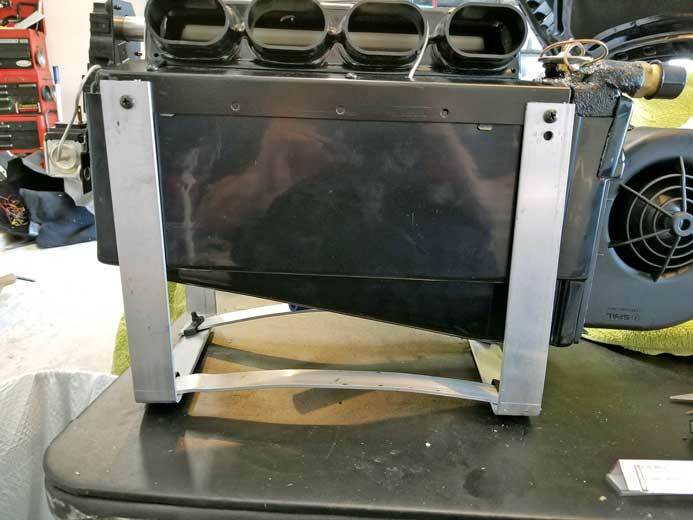 The width of the Street Rod Cooler III unit is 20.875 inches (full dimensions found HERE). 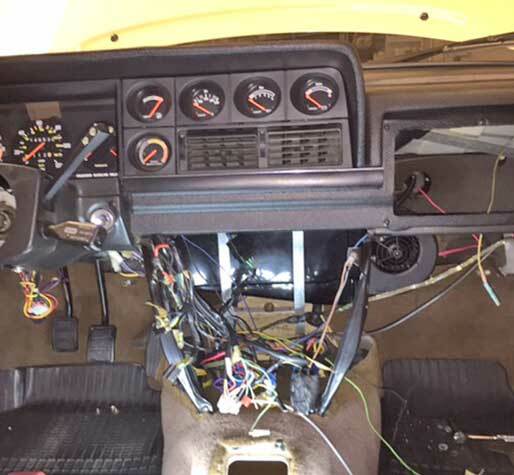 Michael reported that his installation did not require any modification of the rear of the dash or glove box. Classic Auto Air has one larger AC unit (named the "Custom Colder") that is 3.125 inches wider, 0.5 inches taller and 1.6 inches deeper. Michael believed fitting that larger box would have probably required cutting into the glove box. This system will not accomodate the original FRESH AIR VENT below the cowl at the base of the windshield. This means there is no outside air setting for this system. It will only recirculate air inside the cabin. So if you really need fresh air using this system, you'll need to open your lower kick-panel vent or crack a window. That original fresh air hole under the cowl needs to be closed off and sealed to keep the weather out of your car. 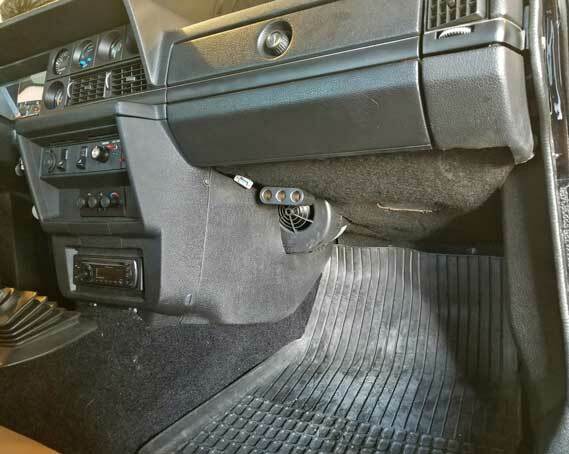 <<< As you can see here, the old original 240 slide controls and vacuum push buttons are gone in Michael's car. In their place is a new electronic contol panel with knobs. It has fan speed, vent selection (front vents, upper defrost, and lower heat) and a cold/warm temp knob. Try not to be confused when you browse Classic Auto Air's webpage. They also show setups using CABLE controls, but they fail to explain very well why they show both setups. Basically the cable controls they offer are designed for classic cars where the owner wants to retain the original look of vintage cable controls. Dynamat Extreme, Dynapad and Dynaliner. I began this installation in the summer of 2017. 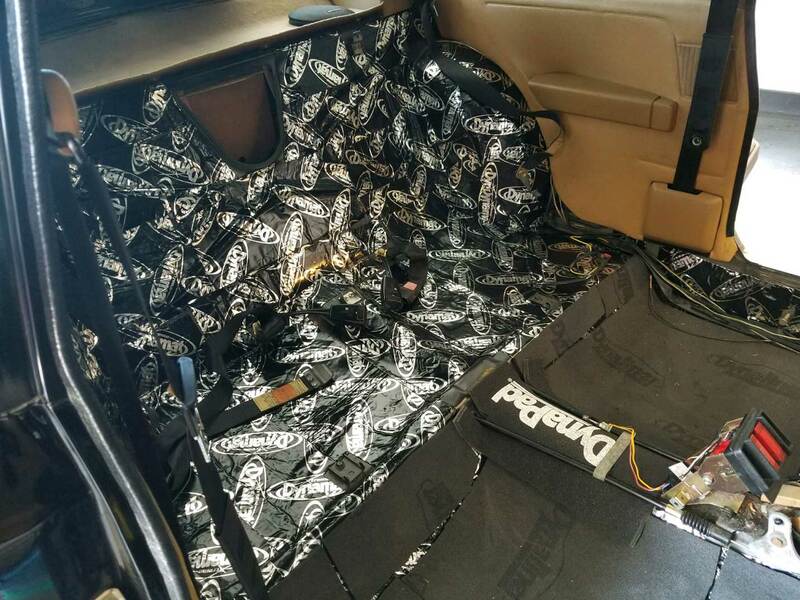 Before working on the AC, I decided this would be a good time to gut the interior and cover as much as possible with sound deadening material. I had been planning this part for a while and I had bought some Dynamat a year earlier. My 242 was pretty loud inside when driving. You didn't really notice it much until you drove a newer, much more quiet car. It made conversation difficult and listening to a radio pretty useless. This was my first experience with Dynamat, however I have used cheaper alternatives in past years. <<< I began with the firewall. 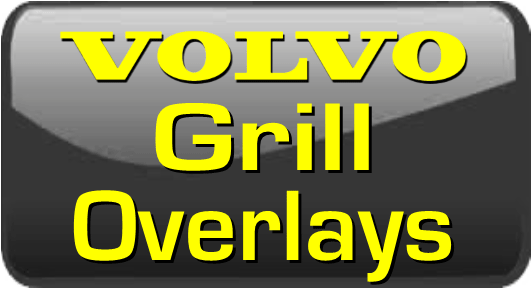 There was originally a thick Volvo factory pad on the firewall made of open cell foam with an asphalt type lining on one side. 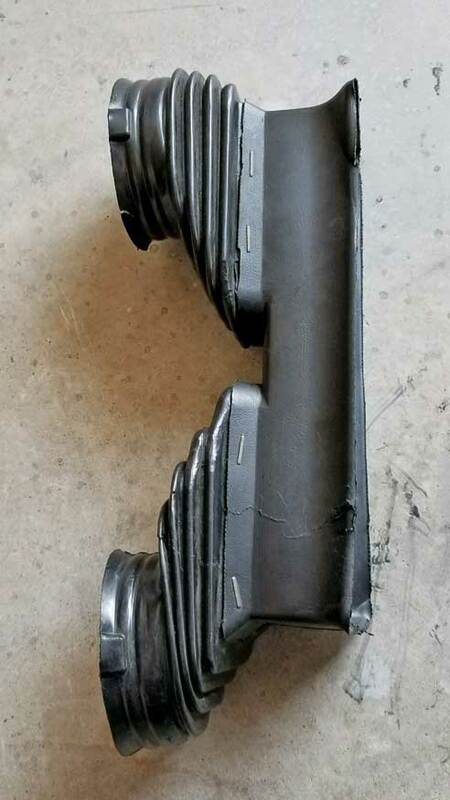 It was the same material as that stuff on the transmission hump in this photo. It was in sad condition, torn and falling down. I pulled the old pad off and began by applying Dynamat Extreme all over the firewall. 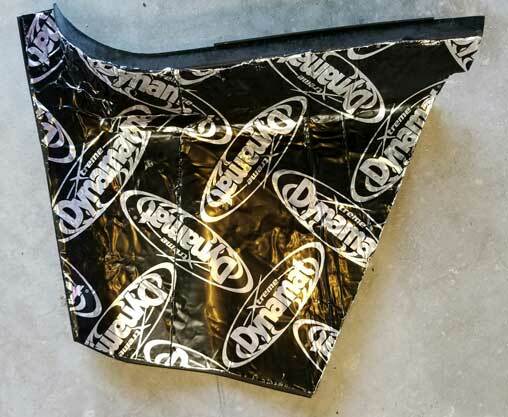 Dynamat Extreme is a peel and stick material with thick butyl rubber on one side and heavy aluminum foil sheeting on the other. It's very flexible, easy to cut with scissors and stays stuck, really, really well. I have used some inexpensive alternatives before and found some of those were not very flexible and had trouble sticking or staying stuck to vertical surfaces. Dynamat does not have this problem and it conforms to any surface shape very well. BE CAUTIOUS OF SOME CHEAPER COMPETITOR MATERIALS: I read a LOT of reviews about many other competitor sound deadening materials before I decided to buy Dynamat. I found that a number of competitors are using a different type of rubbery tar material that can get melt and get RUNNY in hot weather. 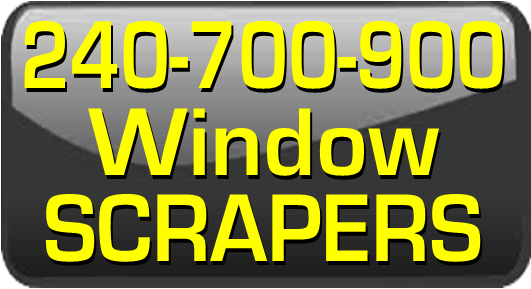 I have seen reviews from some unhappy customers who found puddles of oozing tar running down interior firewalls and out of the bottoms of door panels on hot days, all over their pristine interiors! I decided that is a nightmare I was willing to pay extra to avoid. <<< Then I created a new firewall pad using Dynapad. In this photo you can see it covering the passenger side firewall. 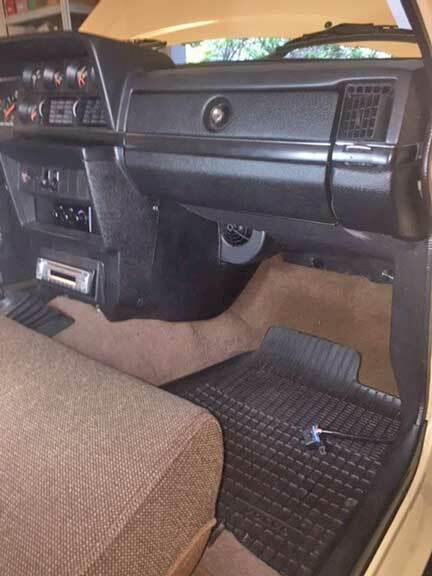 It begins near the gas pedal on the driver's side and extends all the way to the right edge of the passenger side firewall. I used the old Volvo firewall pad as a template and cut the new one with scissors. The old firewall pad was falling apart. 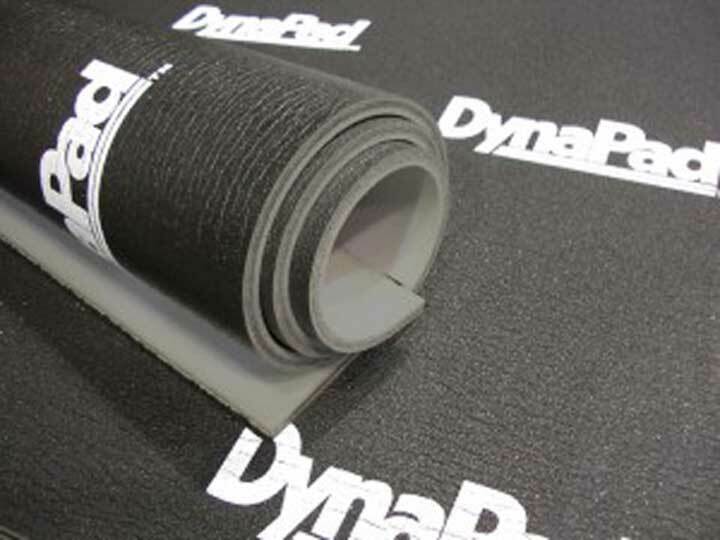 <<< Dynapad is a thick, firm foam material (just under 1/2" thick) with a butyl rubber core. It's fairly heavy, about 1 lb. per square foot. It does not have self-adhesive, so it needs to be held in place somehow if used on a vertical surface. As you can see in the photos, I used the bolts and wide washers that were already there on the firewall to hold the original pad. 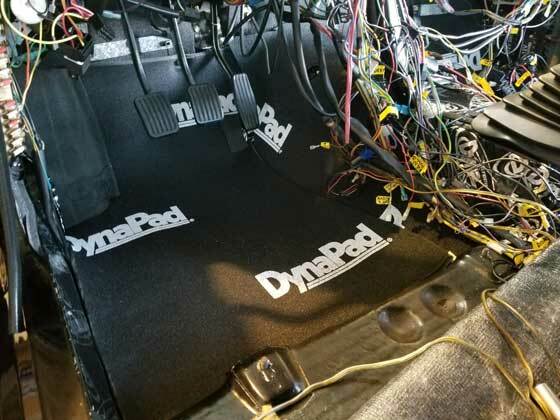 <<< Here's the Dynapad placed on the driver's side firewall behind the pedals. <<< Here I have cut new insulating pads using Dynapad for the front floors and transmission hump. Again, I used the old pads for templates. 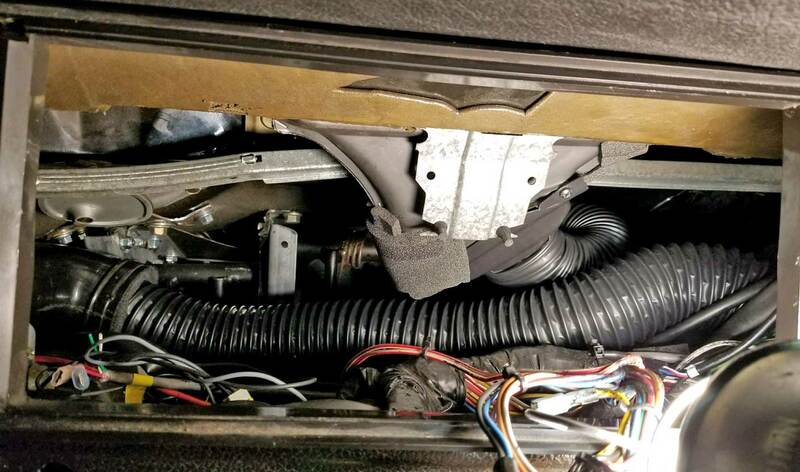 If you're really observant, you may have noticed the original lower heater ducts going along the hump to the floor and under the seats are missing. Those will not be going back in. <<< Another view showing Dynapad covering the driver's floor. <<< And the shifter hump got a new piece of Dynapad. There was an original thick Volvo pad here too. 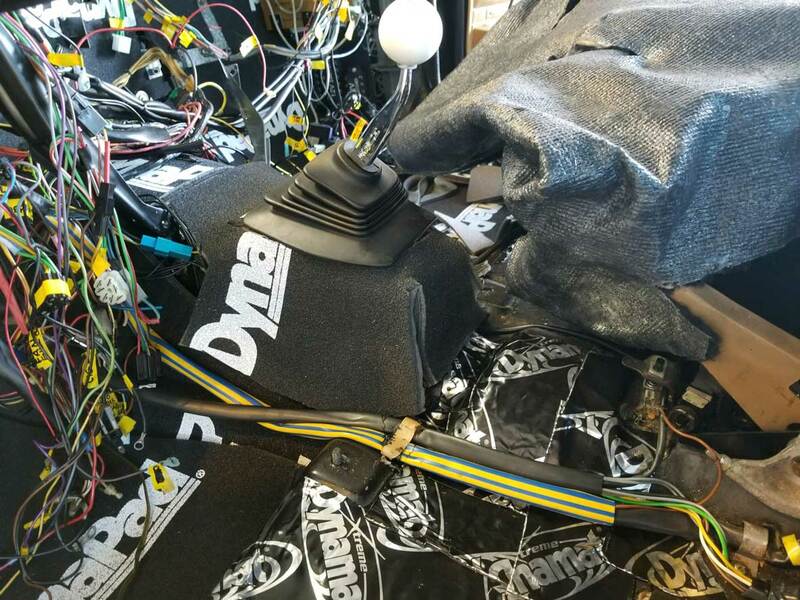 <<< Then I began working my way under the front seats and toward the rear seat with Dynamat Extreme. And you can see here I added a smaller piece of Dynapad over the driveshaft hump behind the parking brake. There was also an original piece of thick Volvo pad here that I pulled out. <<< The side sheet metal under the rear side panels got some Dynamat Extreme too. I also covered the inside of the outer sheet metal as far as I could reach inside there. <<< Then I began putting down Dynaliner on areas under the front seats where I didn't use Dynapad. I stopped at the front of the back seat. 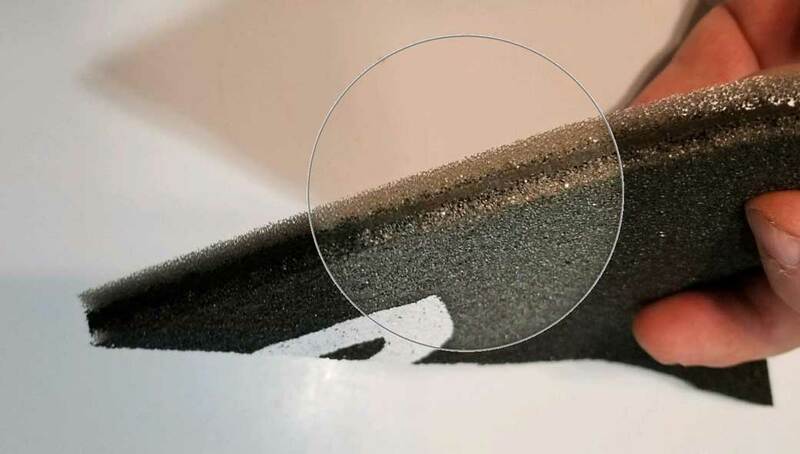 Dynaliner is a smooth closed cell foam with adhesive backing. It comes in a few thicknesses (1/8, 1/4 and 1/2 inch). I used 1/4 inch thickness. 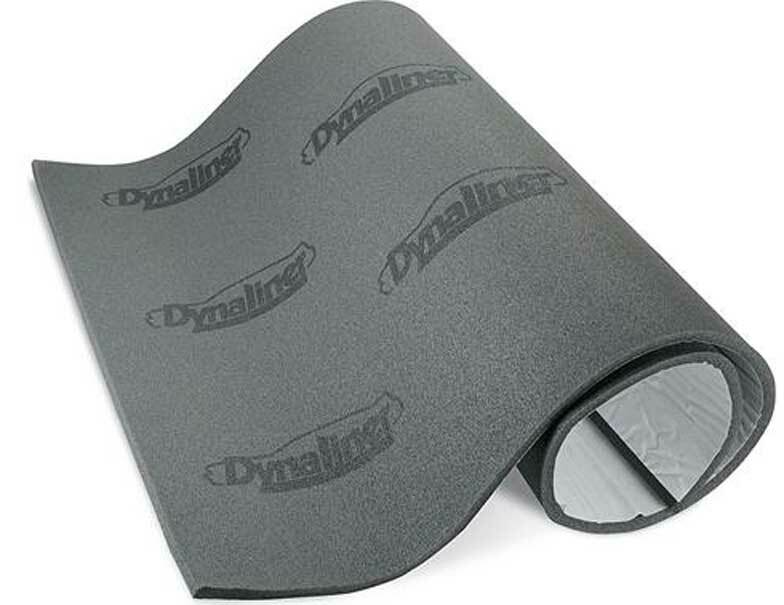 Dynaliner is advertised as a thermal barrier. 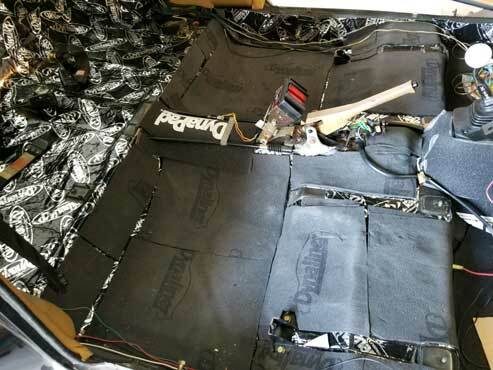 The manufacturer doesn't really say anything about its sound deadening properties, however after watching the VIDEO BELOW of someone putting it inside a Corvette, I was convinced it would be a good addition for noise reduction. Regarding the doors and roof, I didn't get to that at this time, so that would be done later. So how much did this part of the project cost? 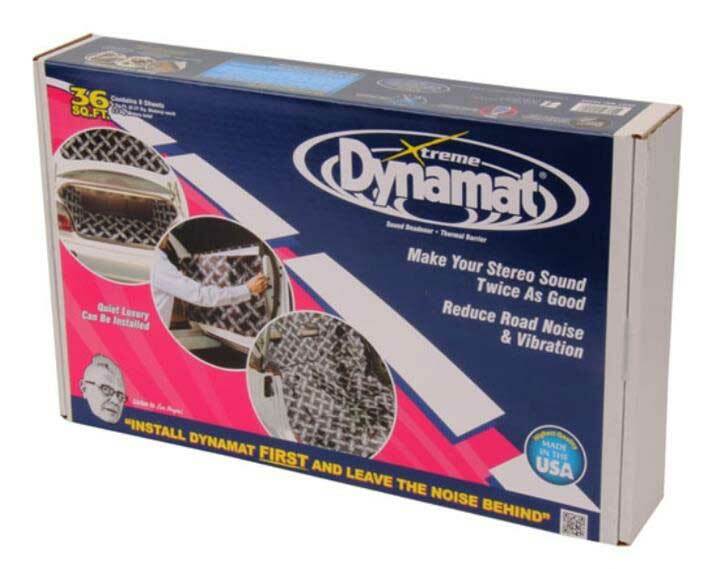 <<< Dynamat Extreme: About $150 per box. 36 square feet per box. Everything you see in the above photos was done using TWO boxes of Dynamat Extreme. 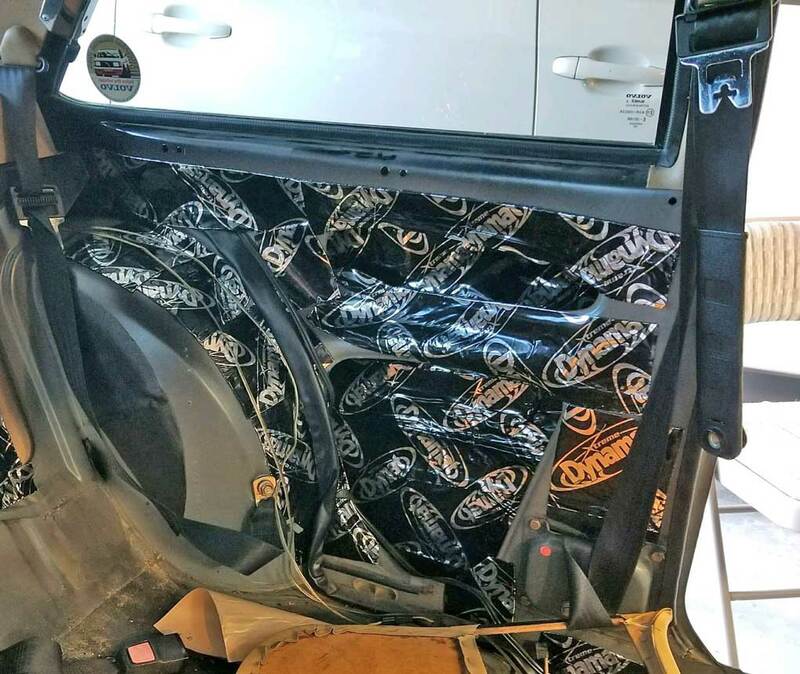 I bought a third box for the doors and headliner, which were not done yet at time of writing this. <<< Dynapad: About $90 per roll. 12 square feet per roll. I used almost all of TWO rolls. <<< Dynaliner 1/4 inch: About $50 per roll. 12 square feet per roll. I used most of TWO rolls of 1/4 inch material. 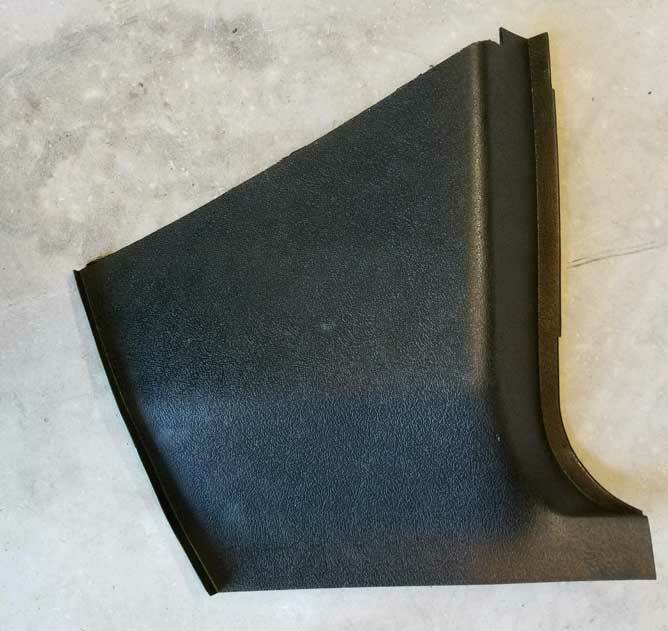 This product is available in 1/8 inch, 1/4 inch and 1/2 inch thick. My overall result was pretty good. It is not luxury car quiet, but it is noticeably better than before. Street Rod Cooler III. PN 1-1091. Price: $685.00. Dimensions: 20.875 inches wide x 9.5 inches tall x 7.125 inches deep. 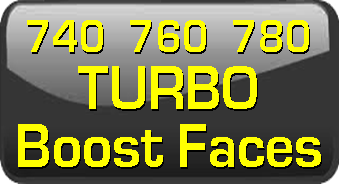 Classic Auto Air's webpage and catalog is mainly focused on tailored kits for vintage domestic cars and a some vintage foreign cars. 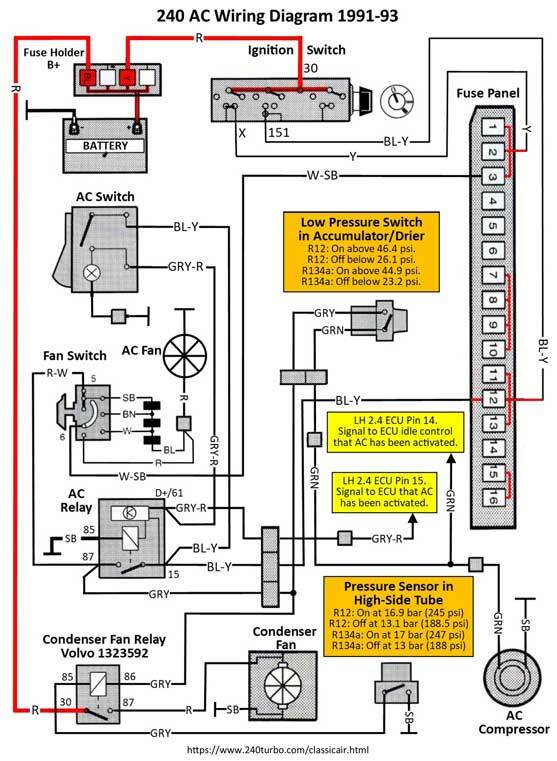 There is a small page on universal AC kits, but I thought it was sadly light on real usable info for someone seriously looking at this as a full custom installation. They could improve things by adding more info about full custom or non-standard installations. You have to hunt through different places in their pages to find useful info. I hope they begin adding more photos, explanations and general info for custom stuff. These custom units can be found by clicking on their Universal AC Systems link. 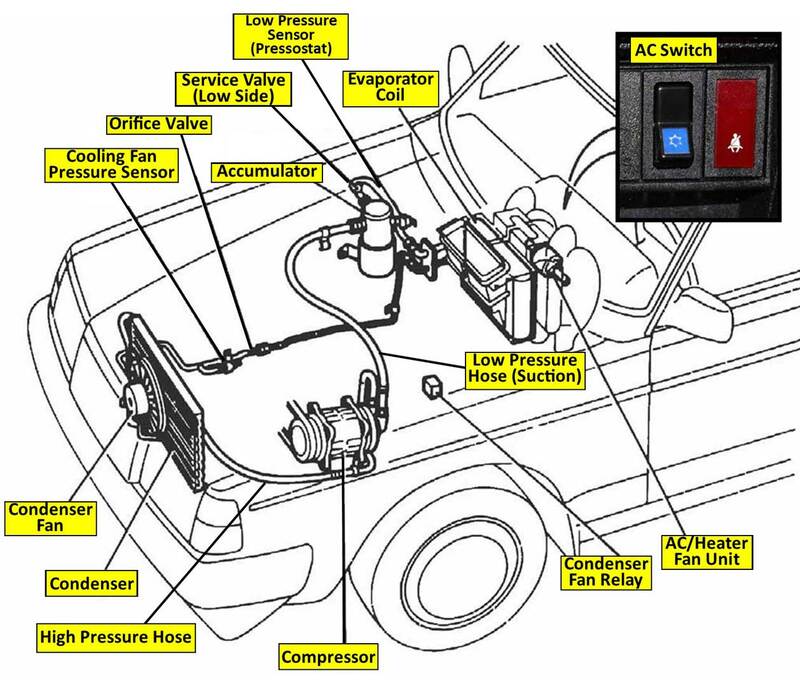 Aside from the awesome information I got from Michael Yount, I learned the most by reading the Classic Auto Air's installation instructions (where the illustration diagram above came from). They have a PDF file found at the bottom of their webpage for the Street Rod Cooler III. 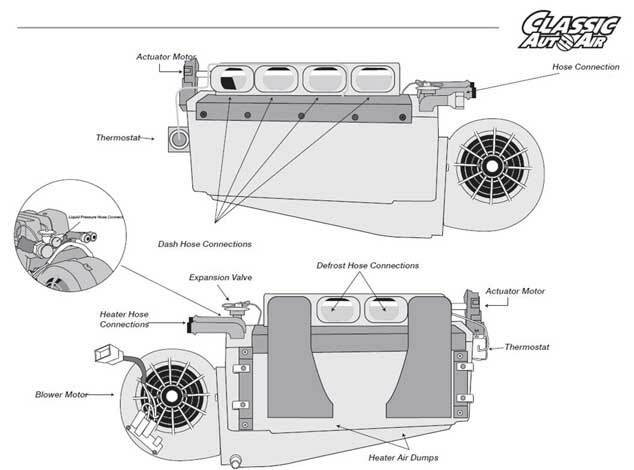 The Heater Air Dumps shown in the illustration above are removable and optional. So you may run the air dumps OR use normal duct hose from those outlets to your lower heat vents if you like. The heater air dumps simplify things if you decide not to run ducts. With heater air dumps the heat will simply be pushed out below the dash through whatever openings exist. This works just fine in a 240, so my installation uses these simple heater dumps instead of long hose ducts to lower vents. There were not many photos of this unit in their site, so I have included some detailed photos here. 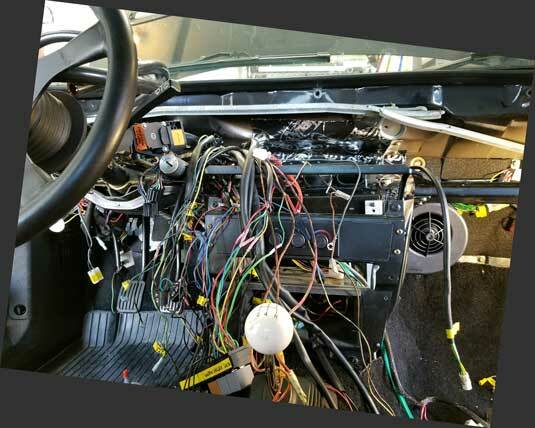 <<< Included with the above AC unit was an ECU and harnesses for making this thing work. <<< I also got this electronic water valve. It was included with the price of the Street Rod Cooler III. It's controlled by the ECU in combination with the temperature control knob. It's designed to allow metered amounts of water for precise heat mixing. 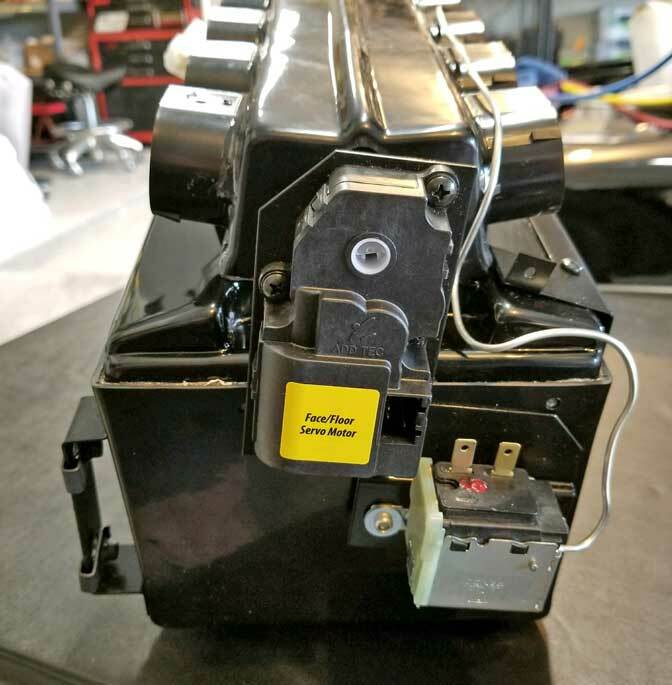 There's an orange label showing which end goes toward the heater core and a green label showing which end goes to the water pump. IGNORE THESE LABELS! 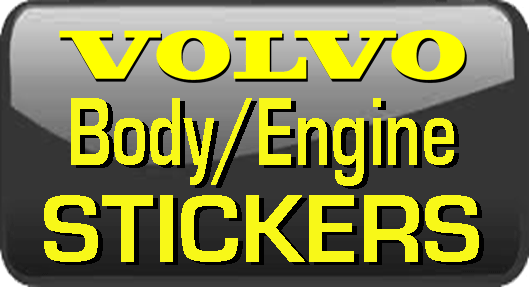 They make no sense for a Volvo with a Volvo engine. See the correct orientation further below: CLICK HERE. <<< The control panels come in a few different styles and finishes. One of these is NOT included in the AC unit price. 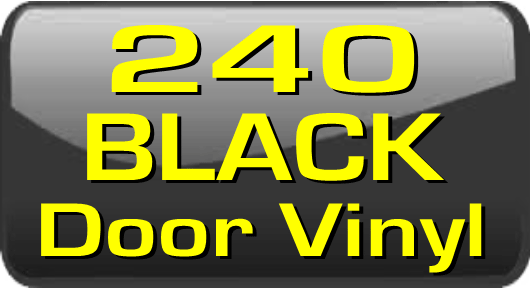 I chose this black anodized knob set in a horizontal configuration. Classic Auto Air offers complete kits and many individual components in their catalog. You'll need to hunt through their site to find their PDF catalog and separate price list. 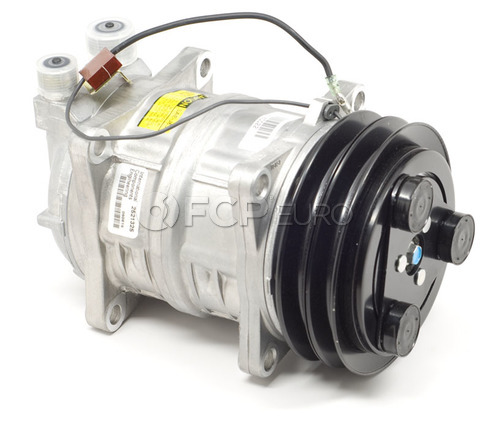 They offer Sanden rotary compressors also if you need one. I didn't buy one from them though. <<< An early 240 like mine originally came with a York compressor like this one, which came in 240s before 1985. 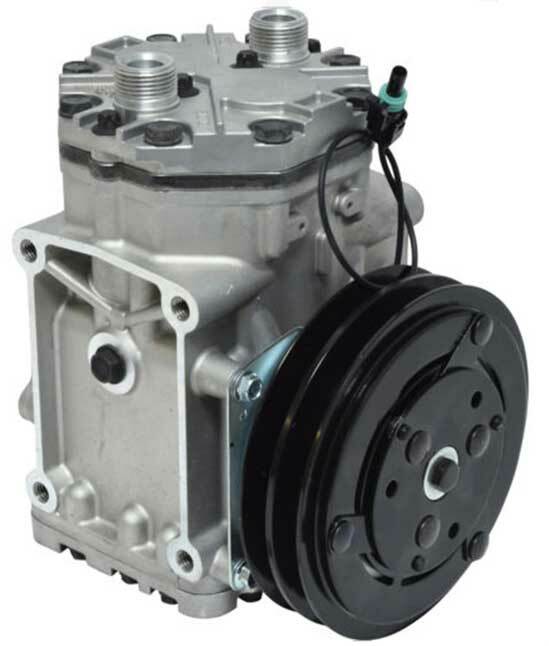 <<< A newer rotary style compressor is better, quieter and more efficient (originally equipped on 240s beginning in 1985). My 240 had already been changed to a new rotary style compressor back in 2002. The compressor was a little noisy after 15 years, so for this project I purchased a new rotary compressor from FCP Euro: Volvo PN 8251069 (click here). 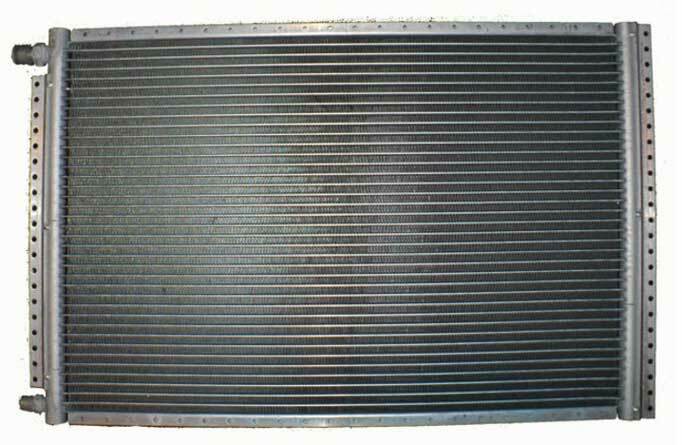 <<< I had already installed an oversized (16 x 24 inches) parallel flow condenser a number of years ago. 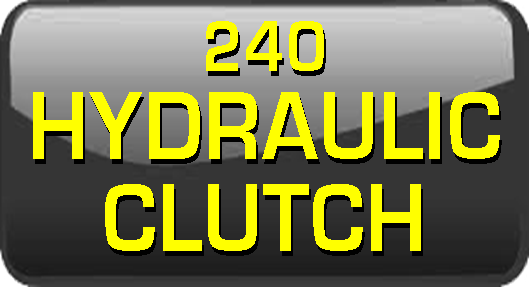 You can buy one from Classic Auto Air or Coldhose. They come in many different sizes. If you're wondering what a Parallel Flow Condenser is, it's basically a newer and better design than the original condensers our 240s came with. They are reported to be about 30% more efficient than the old type my car came with. <<< I also have dual 11 inch pusher fans mounted to this condenser. 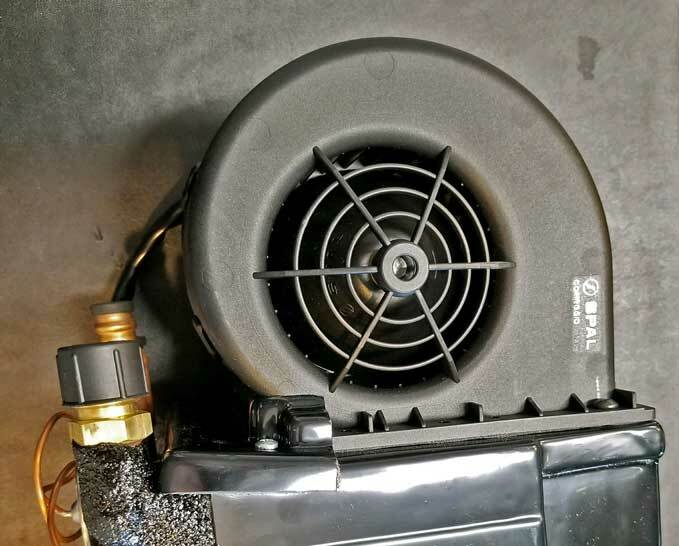 A pusher fan is recommended to get better air flow when stopped or at low speeds. <<< I began fabricating some mounting braces similar to those shown in Michael Yount's photos. My technique was a little different from Michael's, so you can choose the style you like. 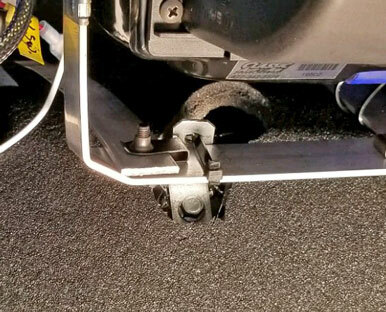 The new AC box comes with some mounting points with U-nuts on the backside. Basically I made it so the box sits about 2 to 2.5 inches above the transmission hump and roughly 4 inches from the firewall. I wanted it to be closer to the firewall, but the heater hoses coming in through the original location were in the way. The kit came with some clear drain tube for the condensation drain on the bottom, but it wasn't very flexible and tended to kink in a tight turn. So I used some silicone tubing I had on hand (that blue hose in the pic). I used 1/8 inch thick aluminum bar stock I had on hand. It can be found in most hardware stores. I chose aluminum because it's so much easier to work with than steel. <<< I used some clip-on barrel nuts (also known as U-nuts) that I had from some previous projects. I got these from McMaster-Carr, PN 95210A150. Thread pitch is metric: M6 x 1mm. These are made for a panel thickness of 0.8 to 4 mm. The bolts I used are PN 98093A436, M6 x 1mm, 16mm long with a flange head. These are identical to the typical metric bolts with a 10 mm hex head that you'll find in your 240. Here are some more views of the mounting braces. <<< This is a photo of the underside of the cowl below the windshield. This is where the fresh air vent was located. I have closed it off and sealed it, not because I hate fresh air. It's because the new AC box isn't designed to accomodate a fresh air vent and if I didn't seal it, I would have water coming in when it rained. I cut a rigid piece of plastic to the precise shape of the hole. It helps to make this piece out of cardboard first. Then after you have the size just right, transfer that shape to the plastic (or metal or whatever material you decide to use). Then I applied a generous bead of 3M black Super Weatherstrip Adhesive around the edge and installed it. I further sealed the opening with Dynamat. Those two brackets are the original sheet metal brackets that used to hold the Volvo factory heater/AC box. As Michael did, I used those brackets for the top mounts for the new AC box. 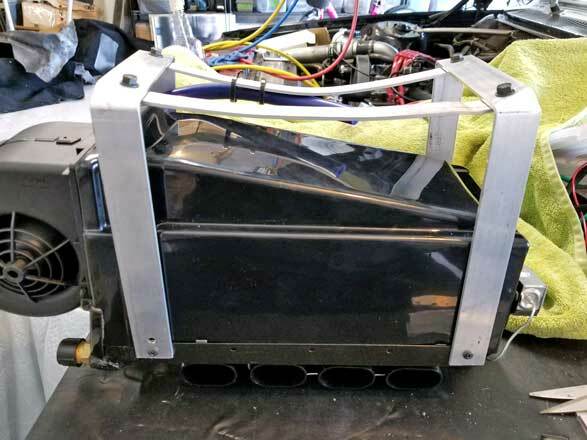 <<< After an endless number of test fittings and adjustments of the AC unit bracket frame-work and of the brackets that were going up to meet the top cowl brackets, I finally felt comfortable about the positioning of the new AC unit. I pushed it as far to the left side as possible and it is actually resting up against the driver's side right center kick panel. 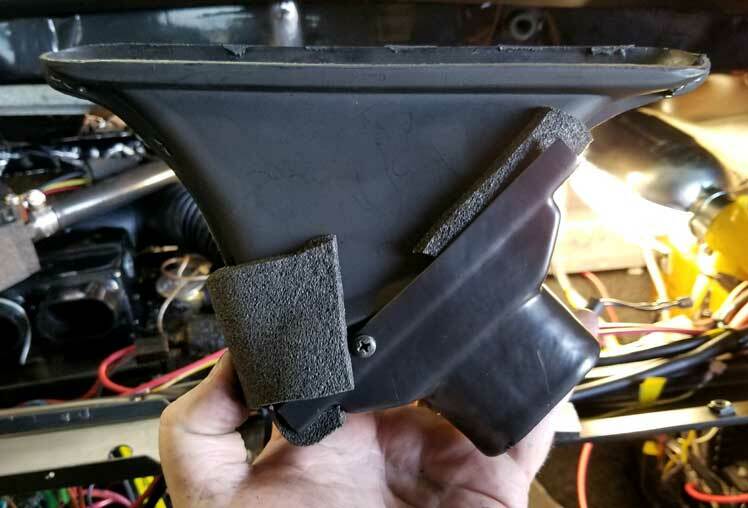 I trimmed some of the plastic off the top of this kick panel to clear the actuator motor and thermostat, which extends a little past and above the kick panel. It's hard to see, but the brackets I made for to the backside of the AC unit now reach up to the top cowl sheet metal brackets. I also bolted in a small steel bracket to the transmission hump below the new AC unit for a lower mounting point. It can be seen in a different photo further below. 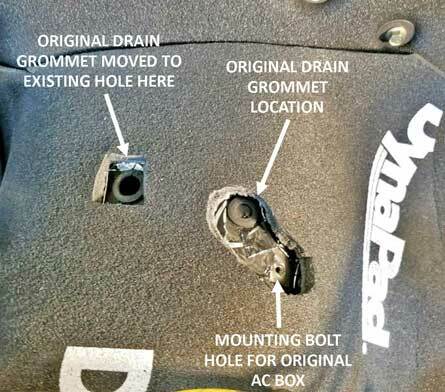 That bolt hole was one of the lower mounting points for the original AC box. At all mounting points I used zipties to secure the new AC unit. It's mounted pretty firmly and all of the vent duct outlets seemed to have adequate clearance from obstructions. <<< This photo is looking down at the transmission hump near the firewall. The original drain hole was in a difficult position for my preference, although it appears from Michael's photos he used it in his installation. 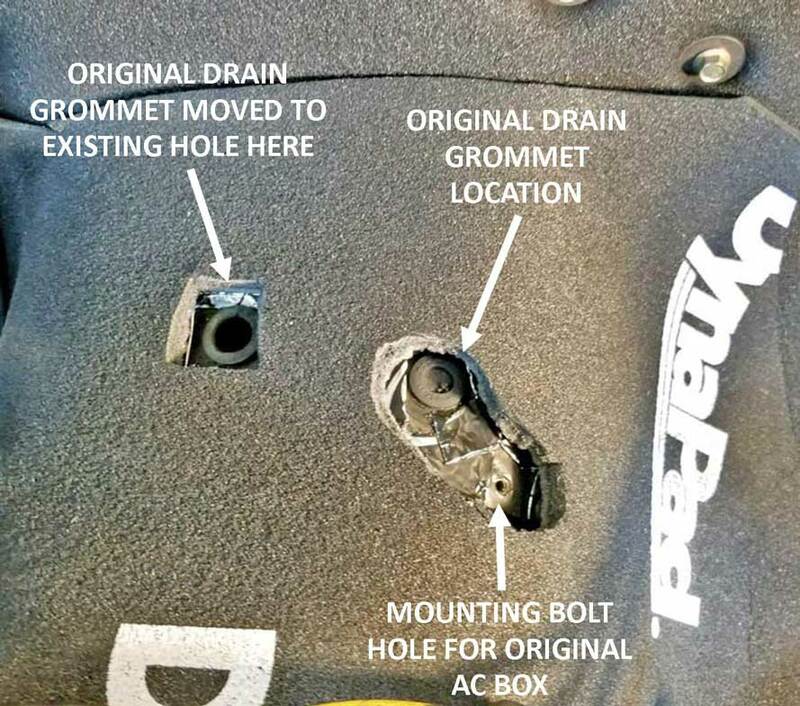 I decided to move the drain grommet to the other hole as shown here, trading grommet locations. <<< Here's a look at the top cowl mounting points that I have zip-tied to the new AC box brackets I made. UPDATE: You should notice that I made a last minute change and moved the HEATER AIR DUMPS from the outer rear air outlets to the INNER REAR OUTLETS, so now they are right next to each other. This was a suggestion by Michael Yount. I found it helped provide more clearance for duct hoses. If you're confused about how I swapped the heater dumps to the center outlets, this would be a good time to tell you this unit does not independently select defrost or heater vents. It sends air through both lower heat and upper defrost ducts equally whenever upper or lower vents are selected, so it really doesn't matter which outlets are used for upper defrost versus lower heat. You can add this to the trade-offs mentioned earlier. This was a small disappointment when I found out, but I got over it. It's not really a big concern for me, since I bought this unit for the AIR CONDITIONING, not the heating. 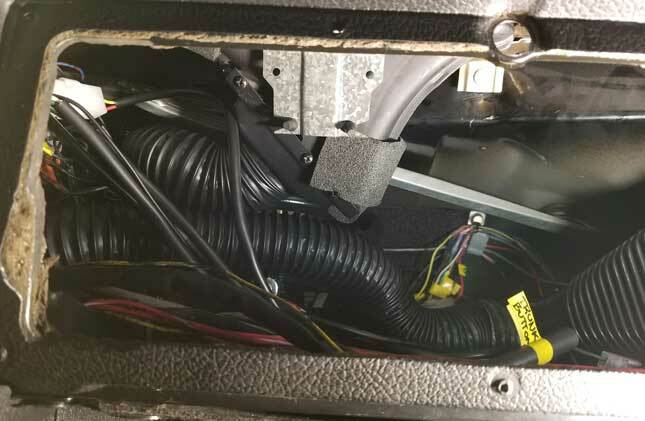 <<< If you think you really must have the top defrost and bottom heat vents controlled independently, there's a larger AC unit from Classic Auto Air called the "Custom Colder" unit shown at left. It's their largest unit and it will do these vents independently. As mentioned earlier, this larger unit is 24 inches wide, 10 inches tall and 8.75 inches deep. That's 3.125 inches wider, 0.5 inches taller and 1.6 inches deeper than the Street Rod Cooler III unit I chose. This larger unit might fit just fine in a 240 dash, except it would add another 3 inches of airbox that you could see under the dash in the passenger footwell. I did not consider any Vintage Air systems for this project, but they also have large AC units that are capable of controlling upper and lower vents independently. 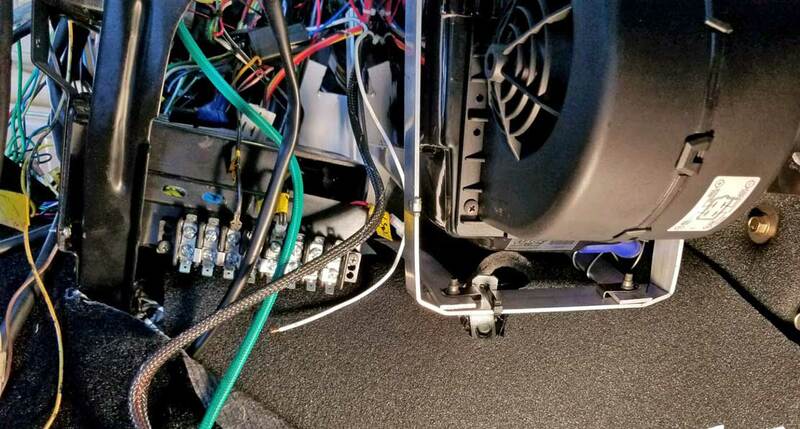 <<< Here you can see how much of the new AC unit can be seen under the dash in Michael Yount's car. Would another 3 inches of airbox under there be too much??? It's hard to say for sure. <<< Here are some views of the lower mounting point mentioned above. You can also see here in my installation there is about an inch of clearance between the new AC unit and the back of the lower storage/radio enclosure. This is not critical clearance. There seems to be plenty of space here. <<< The distribution block you see attached to the lower storage/radio enclosure will be discussed in more detail further below. 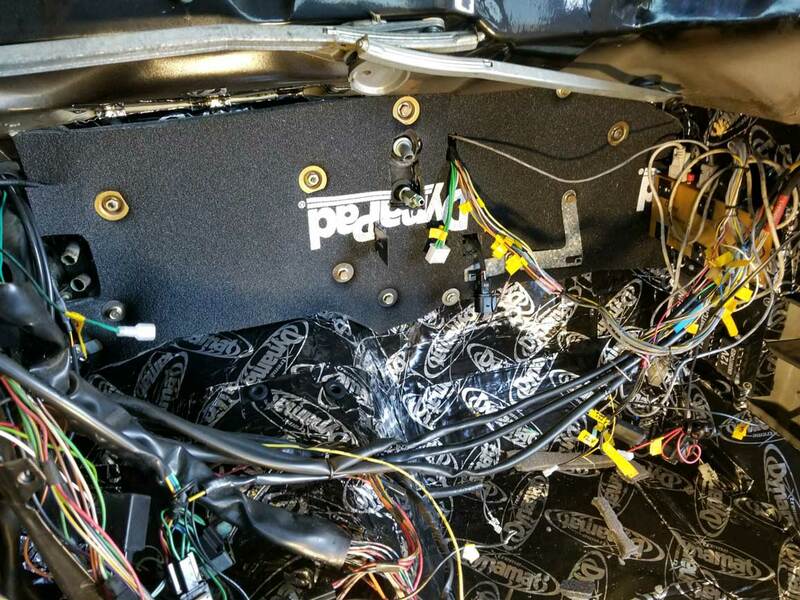 It is used as a central location for the dash grounds instead of mounting them to several different bolts in the dash like Volvo did. This is part of a wiring cleanup project that was badly needed. <<< Close-up of the lower mounting point and small bracket I made and bolted to the bolt hole that used to hold the original AC box. <<< And a pic showing a view from between the seats. 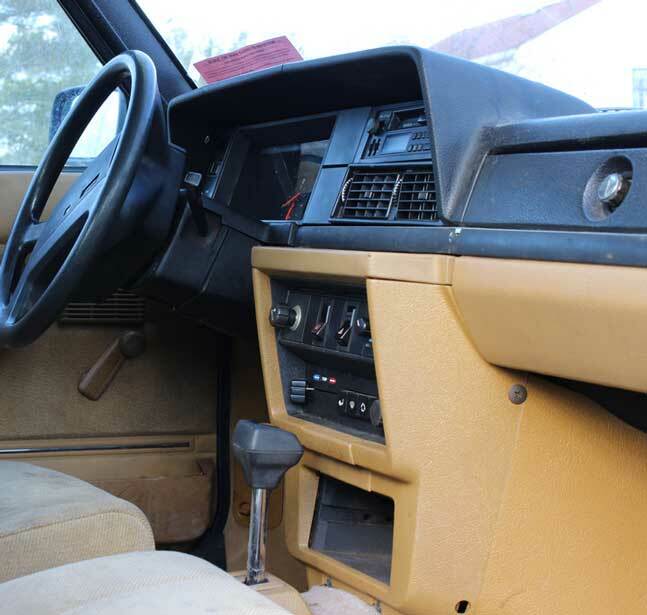 As mentioned above, the AC unit is positioned as far to the left side as possible and is resting against the driver's side kick panel. It cannot be moved more to the left without moving past the driver's side kick panel and getting really close to your accelerator foot. <<< Here I've installed the electronic water valve for the heater and I have plumbed the heater hoses. The hoses come into the cabin through the original firewall location just to the right of the gas pedal. 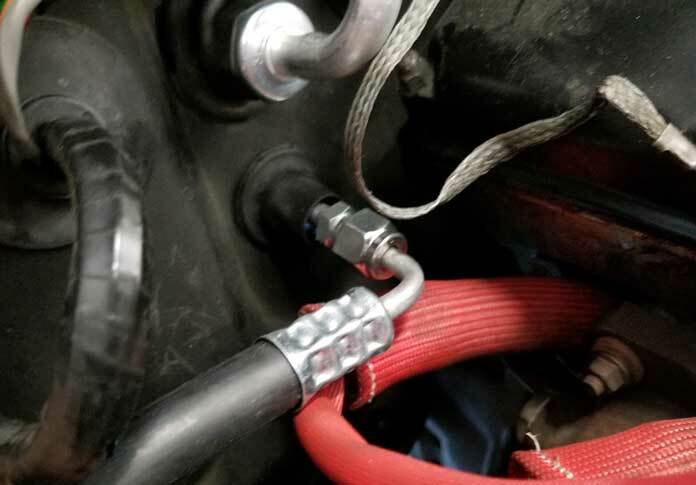 I used high quality reinforced silicone 5/8 inch heater hose. NOTE: Don't pay attention to the valve orientation in THIS pic. I changed it later. More below. <<< Regarding the orientation of this water valve, in this pic I have spun it around 180 degrees from my the previous photo. 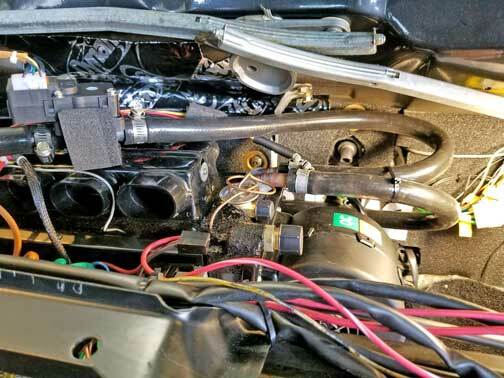 Classic Auto Air's instructions are confusing because it specifies ports on the valve for the water pump and heater core, but then calls for a specific direction of travel, which turns out to be opposite for a Volvo redblock engine. <<< Water flow is from LEFT to RIGHT in this photo. This is the correct orientation for such a valve. 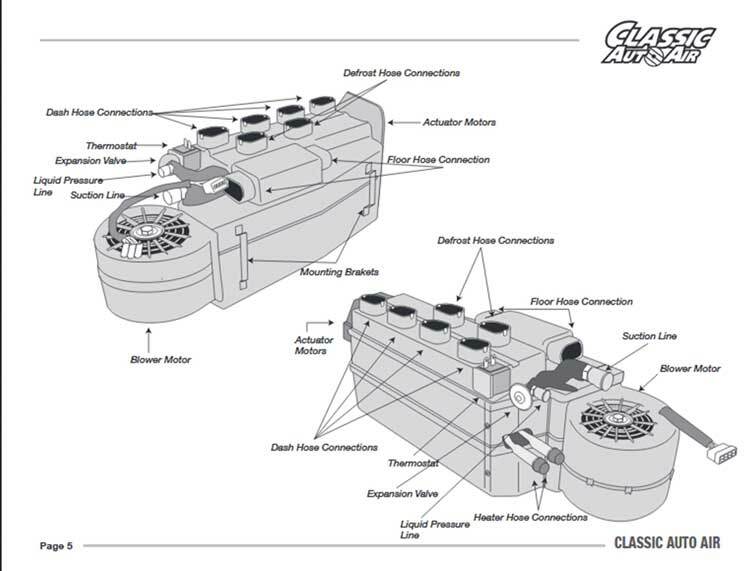 <<< This illustration is from Classic Auto Air's instructions. 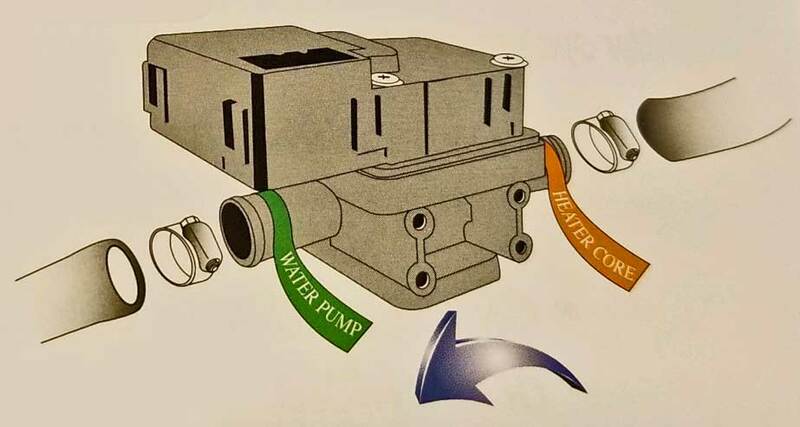 I found that regardless of what's labeled on the valve inlets (for "water pump" and "heater core"), the correct direction of water travel must ALWAYS be AS SHOWN ABOVE and in this illustration. I have my water valve plumbed with the flow direction as shown here by the ARROW. At the 240 firewall, the TOP hose (which comes from the cylinder head) goes to the water valve inlet with the ORANGE label, marked "heater core." 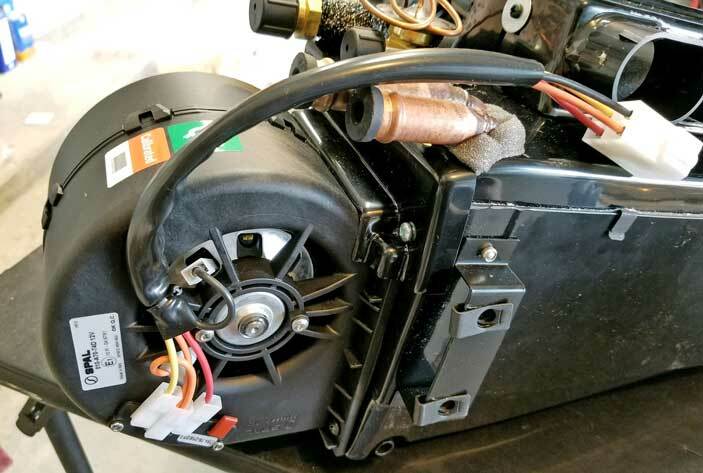 The GREEN labeled outlet, marked "water pump," then goes to the new AC unit heater core. At the 240 firewall, the BOTTOM hose (which goes to the water pump pipe behind the engine) is the return hose from the new AC unit heater core outlet. 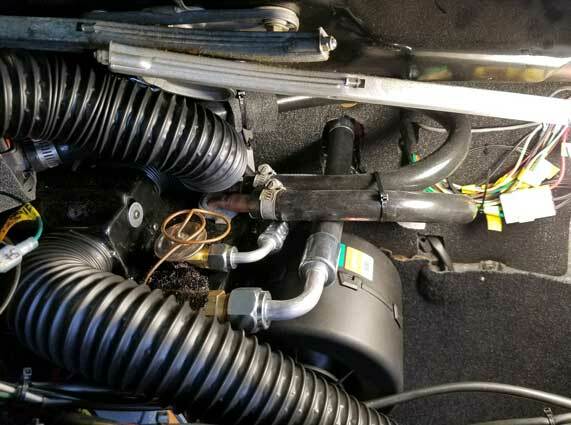 Regarding the coolant inlet and outlet on the new AC unit heater core, Classic Auto Air does not specifiy which one is the inlet or outlet, so I chose the inlet and outlet by the best way the hoses seemed to fit. <<< Here's the ECU for the new AC unit. If you look closely you can see it sitting on top of the lower storage/radio enclosure. It also has some Dynaliner foam that I stuck to the bottom and sides to isolate it from rattling. 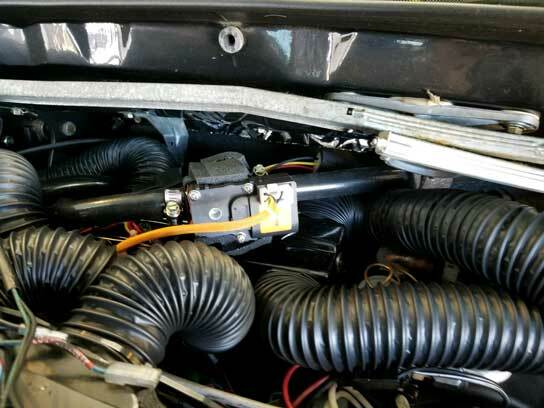 The duct outlets on this new Classic Auto Air unit are designed for 2 inch flexible tubing. They sent me 15 feet of their tubing with my order (like the image to the RIGHT). The tubing fits the oval ducts snugly. I contemplated for a while how to adapt this tubing to the Volvo original front dash and top defrost vents. I didn't need to worry about the lower heater vents, since I was using heater air dumps instead of duct hose there. 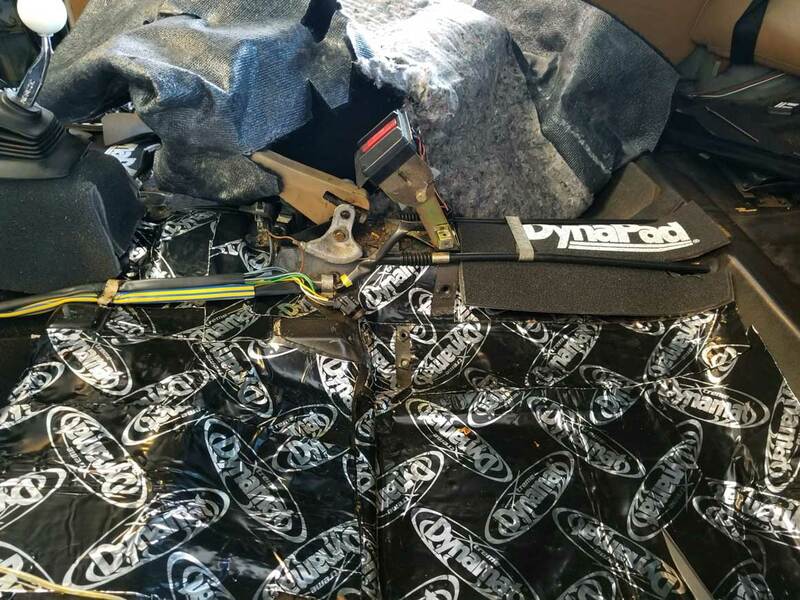 Also you may have noticed the original Volvo heater ducts going to the rear floor (going under the carpet and under the front seats) were removed when I was applying Dynamat. Those are gone permanently. Here's an image from Classic Auto Air's catalog. It shows a number of duct adapters. They sent me a few different adapters with my order that they thought would come in handy. Some did. some did not. Below I've detailed what I used and what I didn't use. <<< They sent 4 of these and they came in handy. Strangely, these are NOT shown in their catalog. They are similar to PN 2-2028-4 in their catalog. The adapters I got were listed on my invoice as PN 0069-4. Cost was $12.50 each. SIZE: I measured them as 5 1/8 x 2 x 2 5/8 inches with an oval tube inlet. <<< They sent 2 of these. 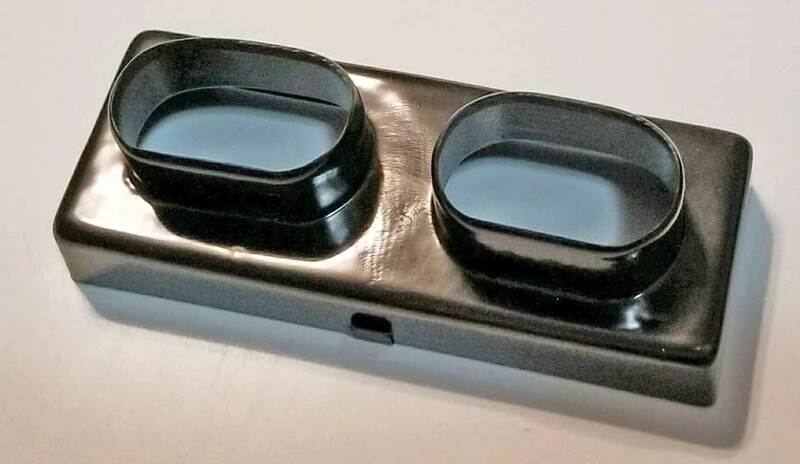 These are defrost vents shown in the catalog image as PN 2-1050. Cost was $17.50 each. SIZE: 6 3/4 x 4 inches. The top defrost outlet is about 5/8 inch wide. <<< I did not use these. Michael Yount said he used some DIFFERENT defrost vents supplied by Classic Auto Air: Classic Auto Air PN 2-1053 and 2-1054. These are shown in the catalog pic above. He attached them under his dash using screws through the dash top. I decided to go a different route using the original 240 defrost vents that you'll see below. <<< Here is my verson of the defrost duct. 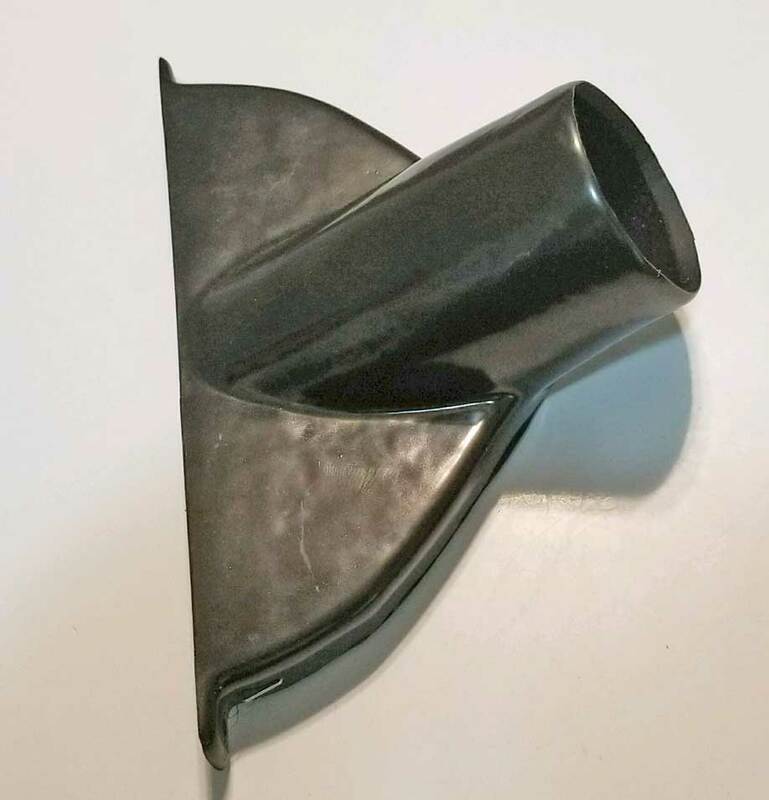 I trimmed a bunch of plastic off each of the original Volvo defrost ducts and then fitted a PN 0069-4 adapter using some screws. I added some spare Dynaliner foam to seal some small gaps. 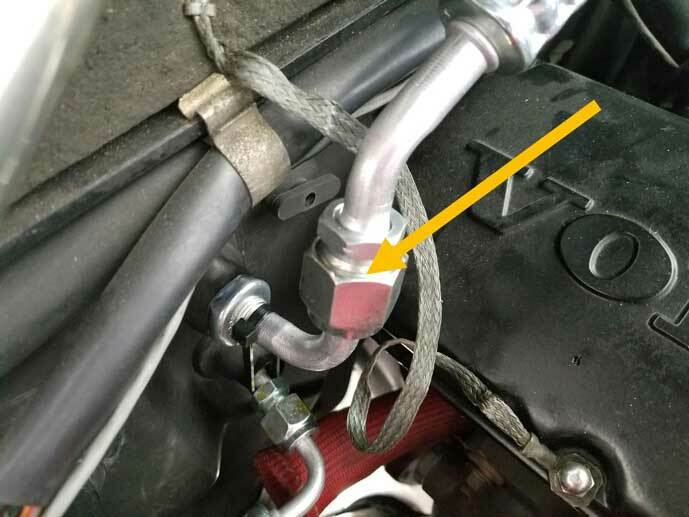 I angled the hose inlet toward the incoming duct hose, so the duct hose fit nicely. <<< There's a screw covered by my thumb in this pic. Sorry. <<< All nicely sealed. 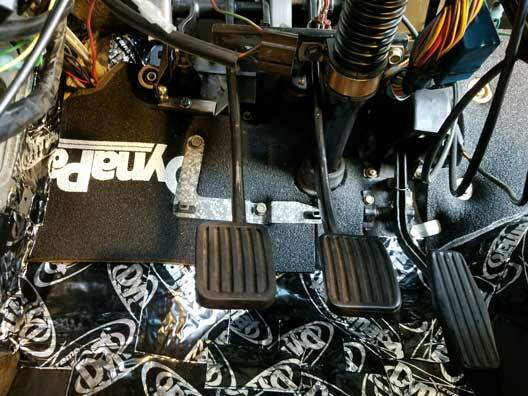 These were then mounted to the underside of the dash using the original rubber nubbs. 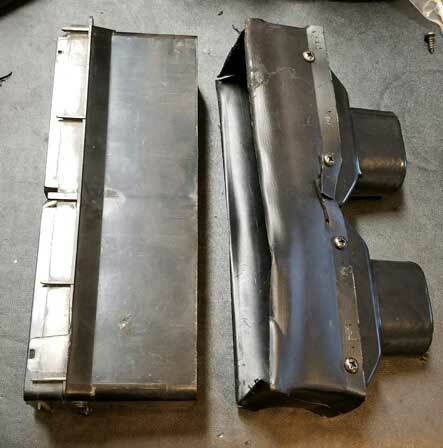 <<< This is one of the original Volvo dash ducts for the right and left end vents. 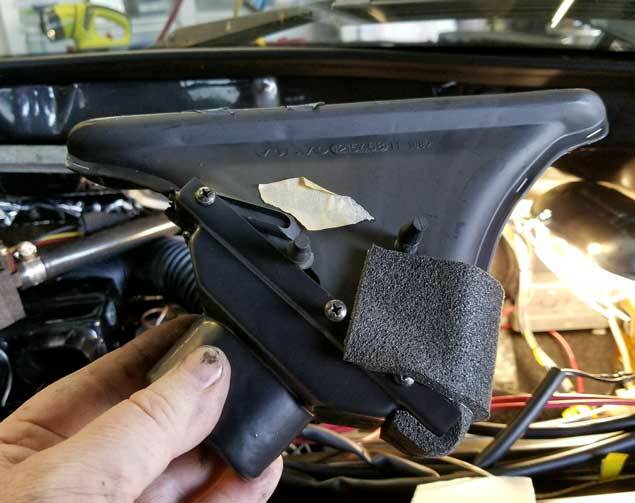 The square end fits onto the back of the Volvo vent. 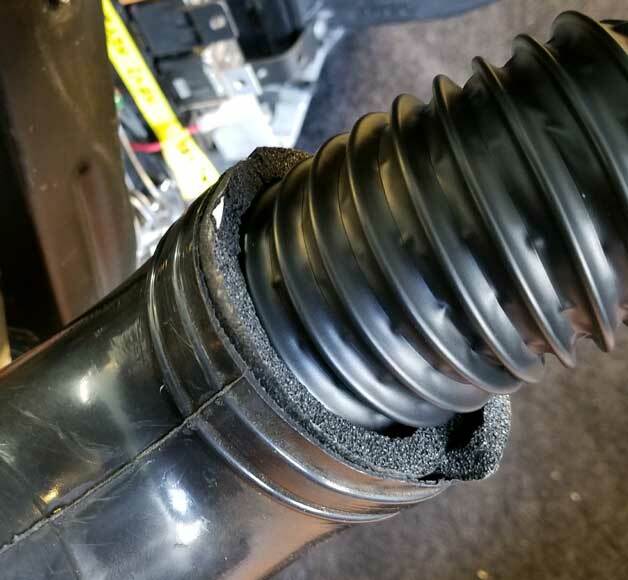 <<< The round end was a bit too large for the 2 inch duct hose, so again, Dynaliner foam to the rescue. I stuck some inside the first inch of the Volvo tube. <<< Look at that! Nice snug fit. <<< Here is the original Volvo duct that's found behind the two center dash vents. <<< The two center outlets on the new AC unit are going to these front center dash vents. They're close together and the original 240 adapter spreads them far apart. Not the best match. 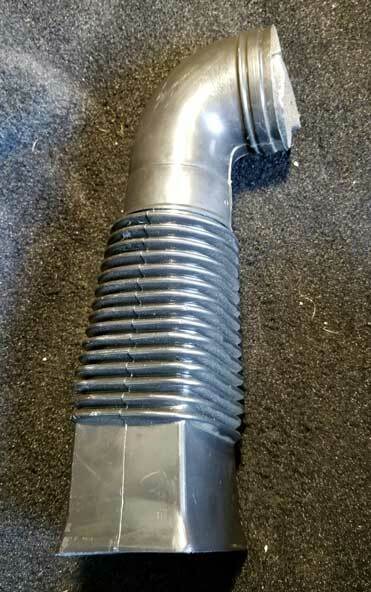 <<< So I ordered PN 2-2027FA-1 Dual Hose Adapter from Classic Auto Air. Cost: $20.00. Then I decided NOT to use it. <<< Instead I built this using parts I had. These parts seemed to fit a little better. 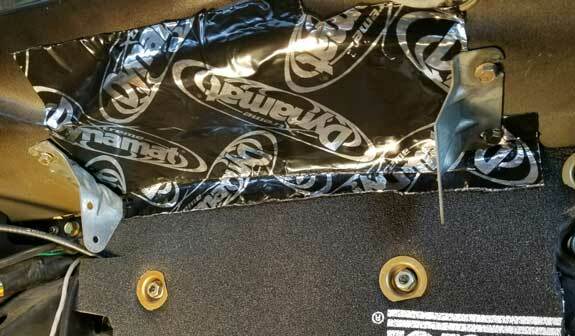 <<< I began by removing the staples holding the bellows pieces on. Then I cut open the thin plastic box so the center divider was gone. And I trimmed and attached the two duct adapters I had left over so they fit well in the box (Classic Auto Air PN 0069-4). <<< Here's my new dual hose adapter next to the center vent it will mate with. <<< Here are the hose ducts beginning to go into place. <<< Dash is now in. This view is through the hole for the main gauge cluster. 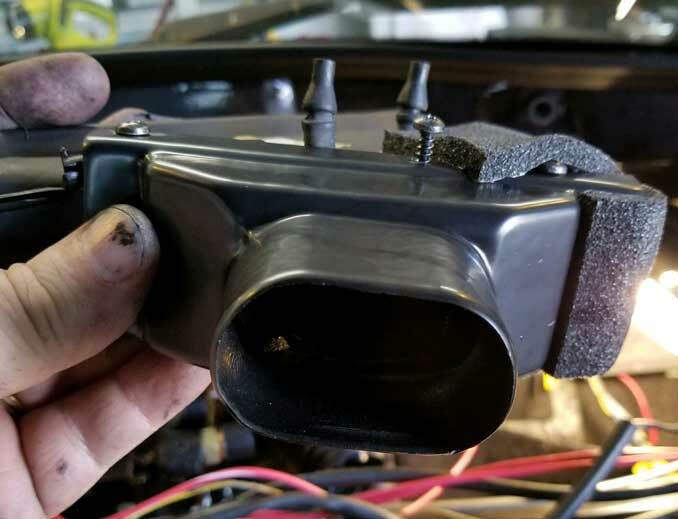 Here's the driver's side defrost vent being held in place using the original rubber nubs. Fits pretty well. <<< And looking through the glove box hole, here's the passenger defrost vent. <<< And here's the right side dash vent. The left side looks pretty much the same. Classic Auto Air has a selection of refrigerant hose parts, however their catalog did not have all the fittings I needed. I ordered the below hose parts from coldhose.com. 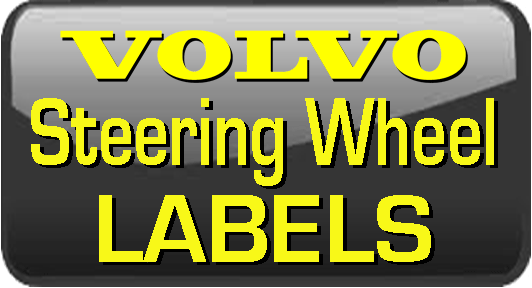 A part inventory list with part numbers is listed below CLICK HERE. For hose fitting assembly, I already had an AC fitting crimper. It's an expensive hydraulic type I bought years ago when I began doing my own AC work. It can cost over $500 now. Since there is now a less expensive option for DIY AC mechanics, I recommend the Mastercool 71550 manual hose crimper. 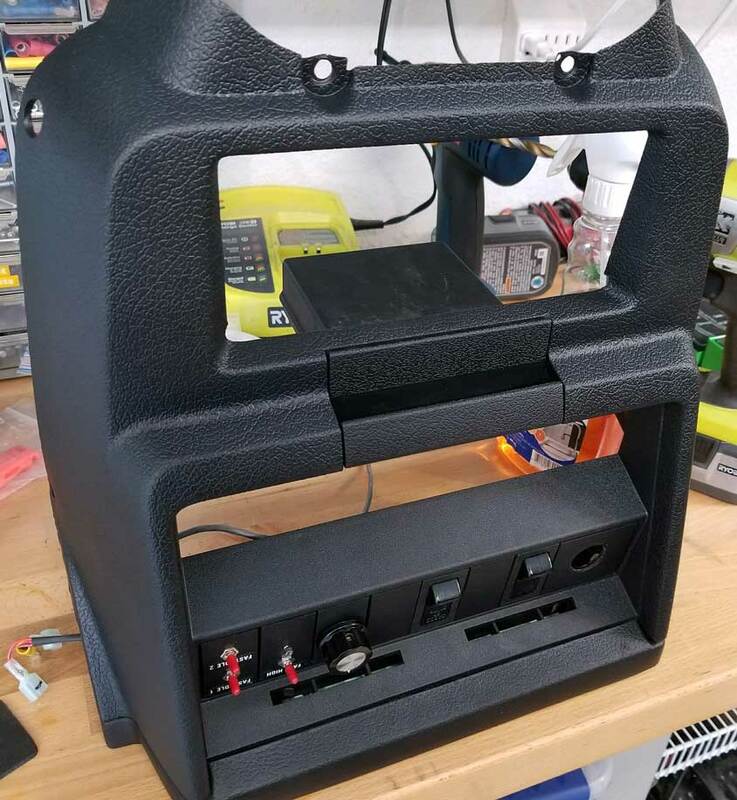 It can be mounted to a vise or a bench and best of all it's only around $150. Or you can go to a hose shop for your hoses. If you do that you can expect to pay quite a bit, so buying your own tools makes sense to me if you might be doing this more than once in a lifetime. There are some interesting alternatives available that you may want to know about. These alternatives do not use the crimping methods shown above. <<< Here's a new drier canister I installed on the right fender. It's mounted using a black universal drier bracket, PN DC0002 from ColdHose, $3.00. The drier I used is an aftermarket copy that is identical to a Volvo 240 drier (1980-89), PN 1370235. The one I have was made by Uro. About $20.00. You should get a drier that comes with the low-pressure cut-off switch shown on top. 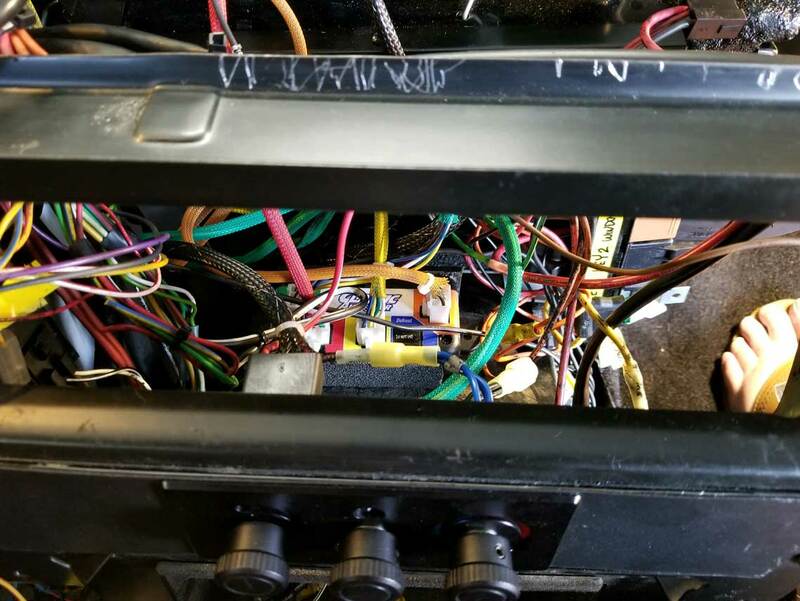 This switch is wired into the AC compressor power circuit and if the pressure drops too low (because you have a leak) the power to the compressor will be interrupted. This drier also has the over-pressure relief valve on top, (closer to the fender). This valve is optional. Having one of those is up to you. I believe most rotary AC compressors have a built in over-pressure valve. Some aftermarket driers don't come with either one of these items, so shop wisely if you want them. The drier is connected using #6 hose fittings shown in the photo. One is straight and one is 90 degrees. The hose coming from the condenser to this drier begins at the condenser with a 90 degree fitting (not shown). It's identical to the 90 degree fitting in this photo, except it does not have a high side discharge port. This 90 degree fitting in this photo has the high side discharge port, which is useful for hooking up to your AC gauge manifold high side hose. The hose going from the straight #6 fitting on the drier in this photo goes to the firewall and then to the new AC box. All fittings shown are aluminum. Steel fittings are available if you prefer that. <<< This is the #6 hose coming through the firewall to the new Classic Air AC unit. The 90 degree fitting on the right gets crimped to the #6 hose coming from the drier. 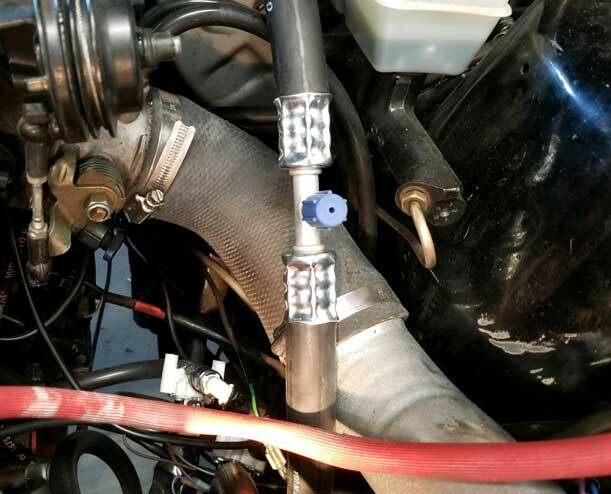 I made it this way so I could have a quick 90 degree bend at the firewall instead of the typical hose coming out over the exhaust manifold and then turning. 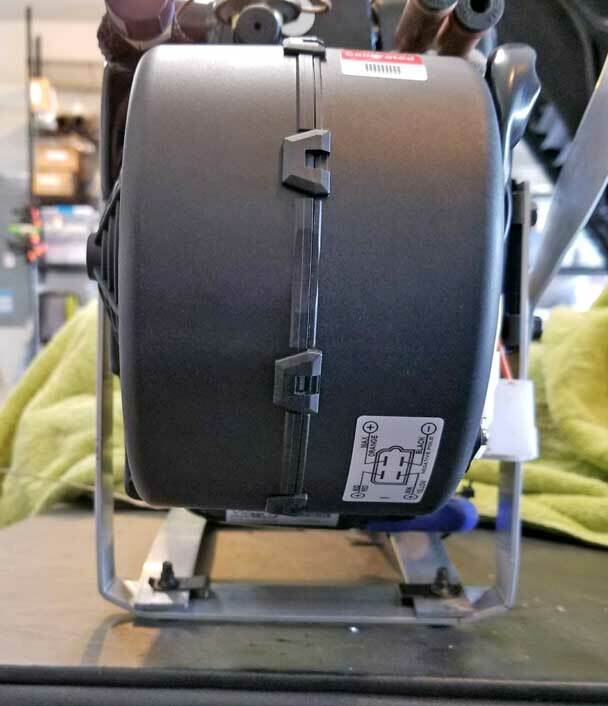 The 90 degree fitting on the left side connects to the high-side inlet on the new Classic Auto Air unit. <<< Here's that 90 degree fitting I mentioned above turning and going through the firewall. 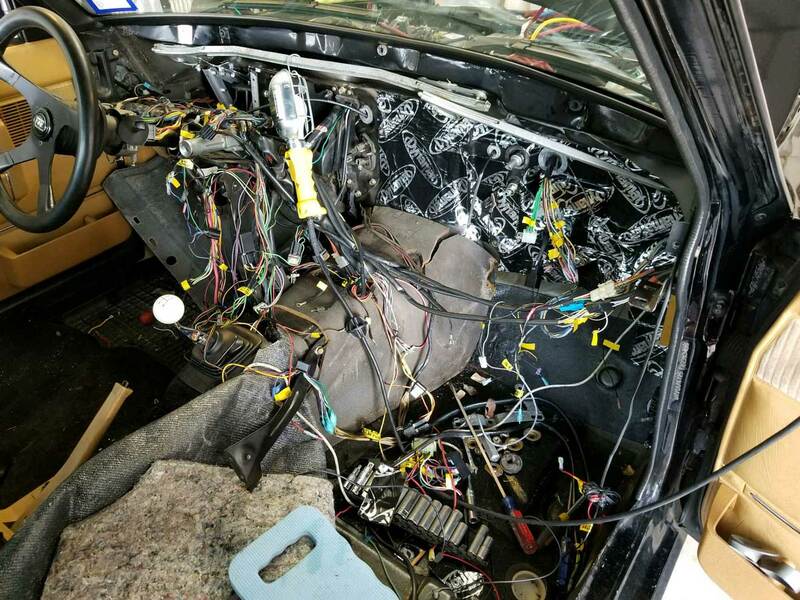 <<< And here are the hoses coming into the dash from the firewall and connecting to the new AC unit behind the dash. The small hose is the same as the one shown above. It's the high pressure hose coming from the condenser and drier on the right fender. <<< The large hose in this photo returns to the compressor. This hose is shown below in more detail. 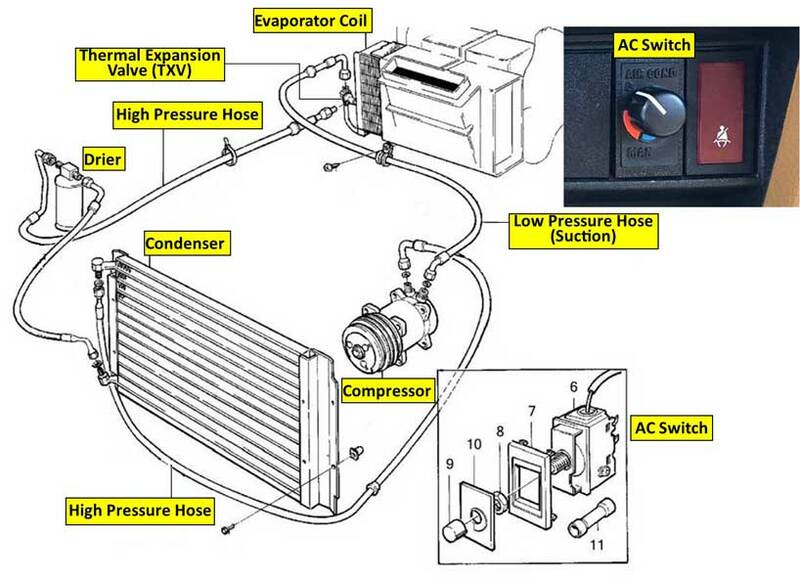 <<< This is the large #10 hose seen above coming from the AC unit through the firewall to the compressor. The 90 degree female fitting on the left side goes to the AC unit. The 90 degree female fitting on the right side goes through the firewall and then turns left to the #10 hose going to the compressor. <<< Here's the 90 degree o-ring fitting coming through the firewall. It connects to a Male Insert o-ring fitting before heading toward the compressor. Something to keep in mind when trying to figure out how to order fittings: A female o-ring fitting always fits a male INSERT o-ring fitting. <<< Here it's connected. I chose a 45 degree fitting for that male insert o-ring fitting. 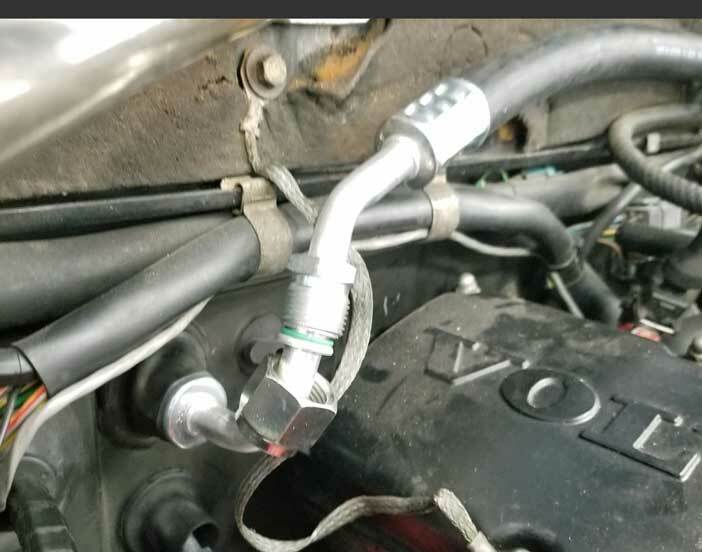 I did that because my original plan to have a straight fitting there made the AC hose a bit too close to the valve cover. That could make removing the valve cover more difficult. 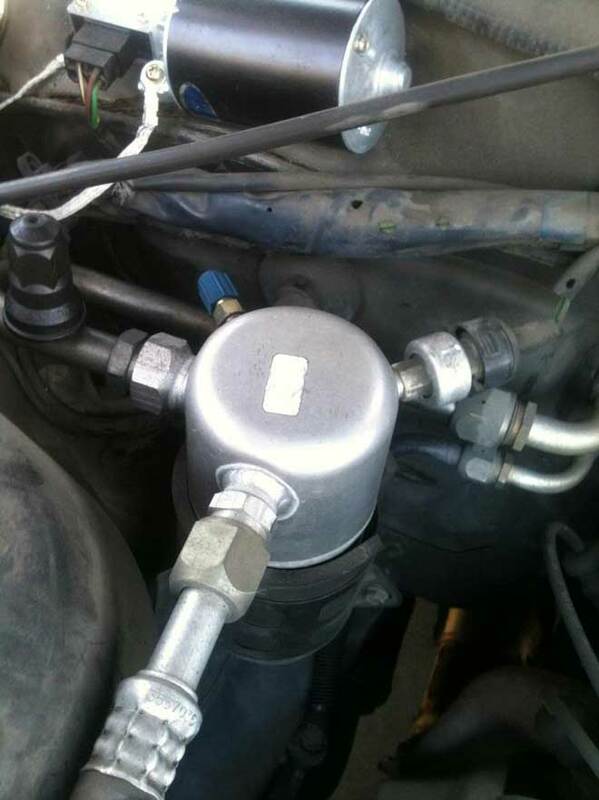 <<< This is a splice fitting that I have inserted in the #10 hose going to the compressor. It has a low-side port for charging. 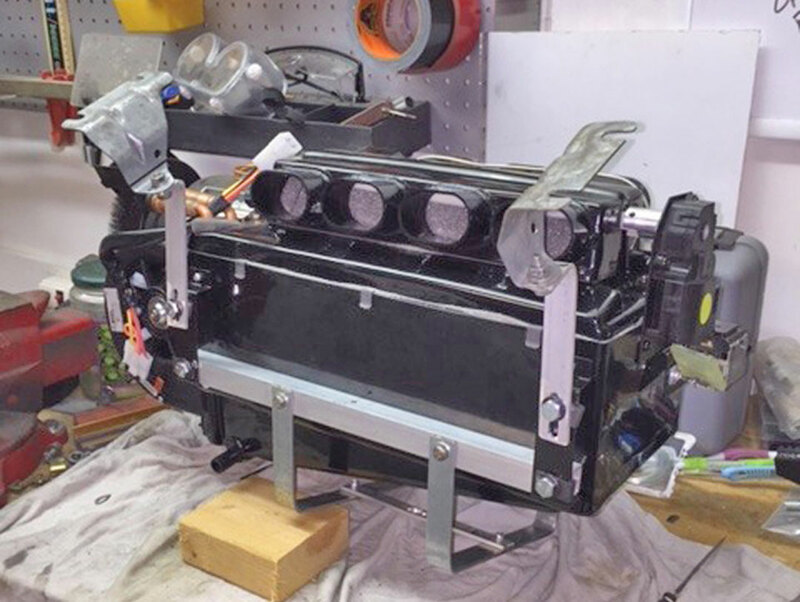 This is a #10 (1/2") Inline Splicer with an R-134a 13mm Suction (low side) Port, PN BL6103-3. <<< And finally here's the hose that goes from the splice fitting to the compressor. 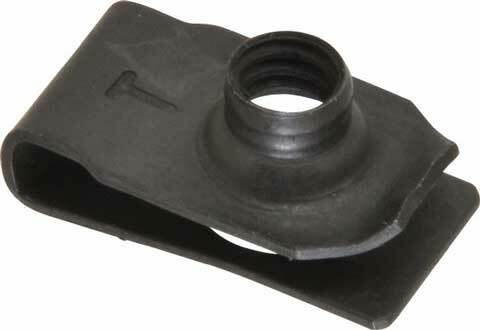 This fitting is a #10 Female Straight O-ring Fitting, PN BL1303. I did NOT discuss the hose from the compressor to the condenser, which calso be seen here. This is because I used the existing hose I installed back when I installed that new condenser. It's constructed using the following: #8 Female 90 degree O-ring fitting, PN BL1322 at the compressor. Then a length of #8 barrier hose, PN BH8. Then at the condenser there is another #8 Female 90 degree O-ring fitting, PN BL1322. 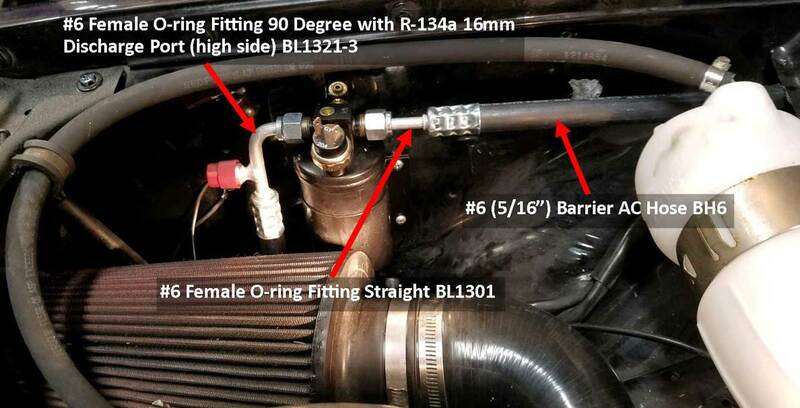 <<< Here is an overall view of the #10 hose from the firewall to the compressor. This list covers all AC hoses. All fittings are aluminum. Below items were ordered from coldhose.com. 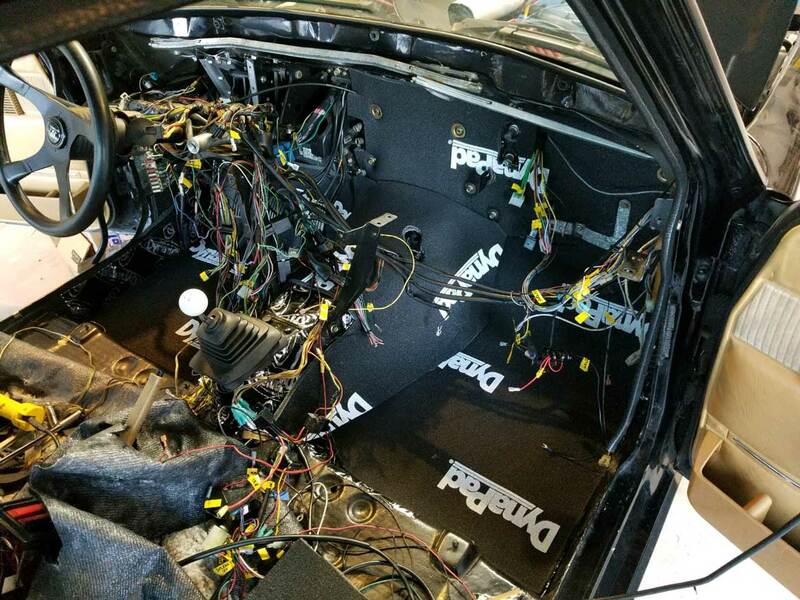 When you pull the dash (and an original AC box) out of a 240, the spaghetti mess of wires can be overwhelming. In many of these photos you can see pieces of yellow electrical tape with marker writing wrapped around some wires. 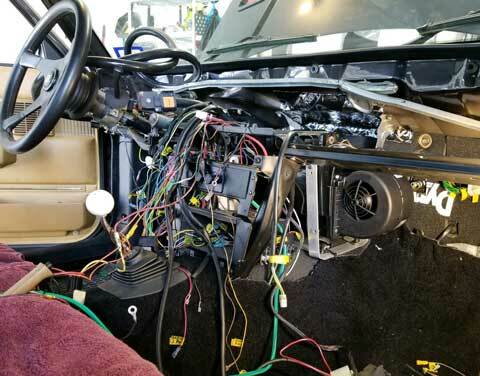 As I began this disassembly I marked every wire or connector with tape and a description of where it went or where it came from. It was time consuming, but well worth the effort. 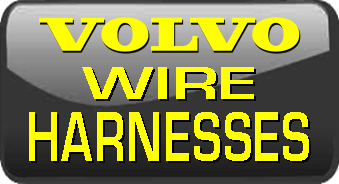 Trying to find all those wire locations later without this info would not be very much fun. Also it's helpful to grab your cell phone and snap some photos of this stuff as you go. That may help out later and you'll have some nice photos to impress your Prius driving friends at parties. 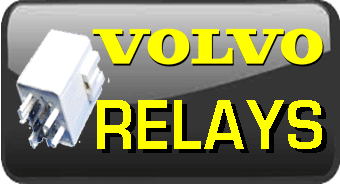 <<< One of the things I did to clean things up was to move the location of the dash relays. I don't understand why Volvo engineers thought hiding the relays deep inside the dash behind the vents was a good idea. 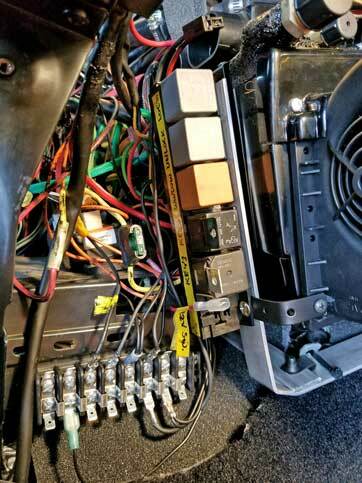 Now I have placed these relays behind the inner passenger side kick panel. Some wires needed to be extended on the relay connectors to reach this location. <<< I added this ground terminal distribution block attached to the side of the center storage/radio enclosure. This allows me to have one central location for all the dash grounds found in that center dash area. There is one big fat cable connecting this block to one ring terminal bolted to a convenient dash bolt instead of a bunch of ring terminals connected to different dash bolts all over the dash like Volvo did. 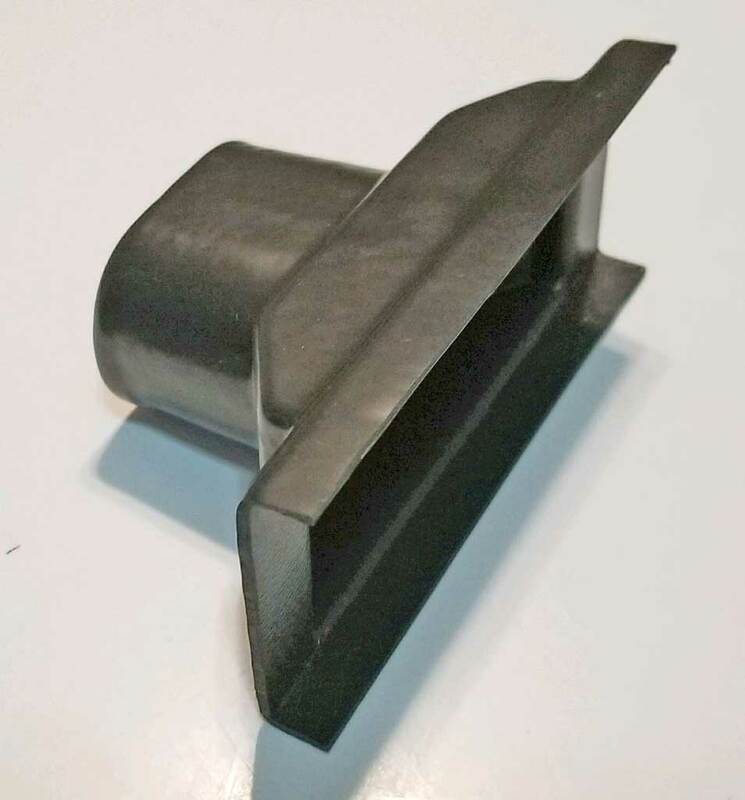 If this is something you're interested in, I have a few extras and I have made them available in my harness parts page here: https://www.240turbo.com/blackvinyl.html#terminalblocks. <<< This is the right side, below dash area, behind the right passenger kick panel. My engine management system is here. 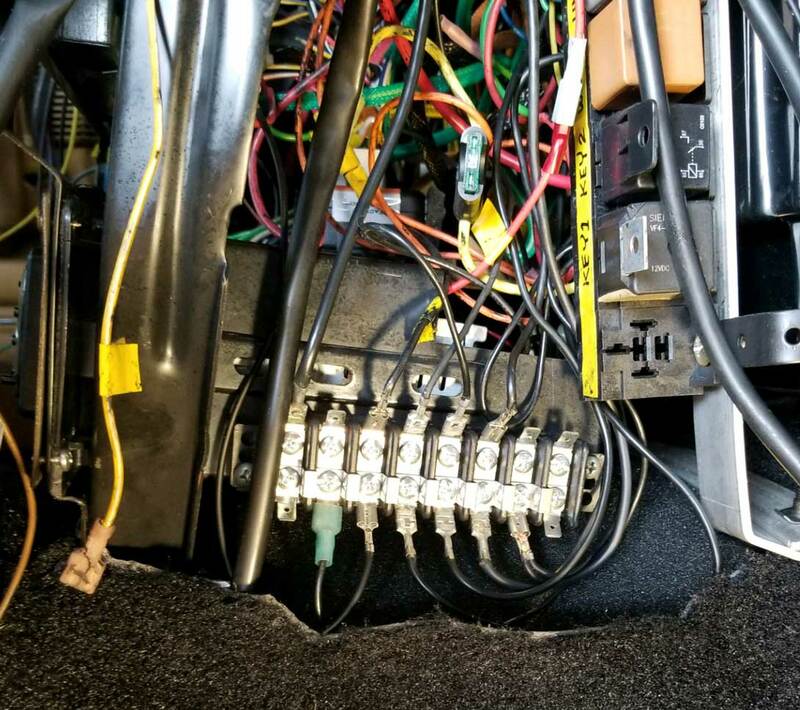 In order to better organize the wiring you can see here I've added three more distribution blocks: 12 Volt Key 1, 12 Volt Key 2 and Ground. 12V Key 1 has power when the key is it the first power "ON" position. 12V Key 2 has power in the second (or "RUN") position. The covers for the distribution blocks are not available. I made them custom because I wanted some protection for the hot leads. I made the covers by forming some 1/32 inch gray PVC plastic sheet from McMaster Carr: https://www.mcmaster.com/#8748K21. I then painted them black and added labels. That PVC sheeting may be formed easily with some heat from a hair drier or heat gun and is easily trimmed with scissors. If you try this, make a cover out of cardboard first so you have a good template. 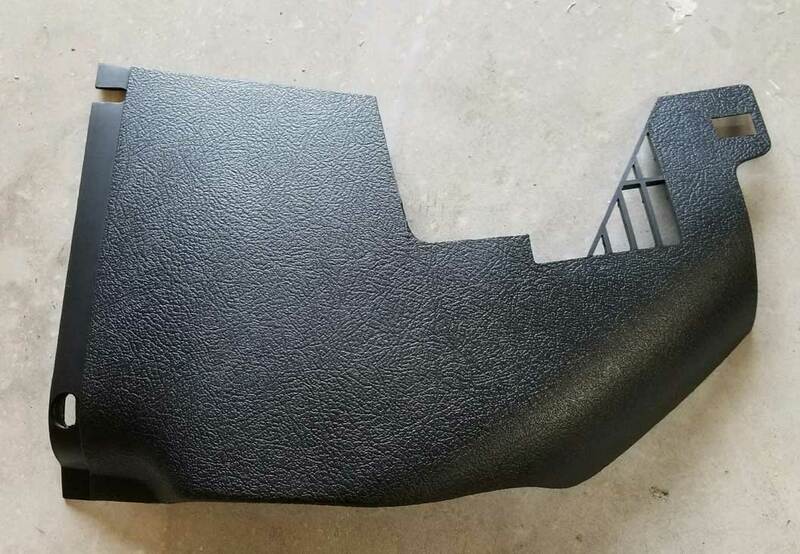 <<< Before doing this project, I had a black dash with tan lower parts and a tan center console and kick panels (similar to this random 240 pic). I decided to change everything in the dash to ALL BLACK. <<< No, I didn't paint my tan parts black. I already had some black parts I began collecting a few years back. They were looking a bit old so I cleaned them thoroughly and renewed them with some fresh black paint. I used SEM Color Coat Satin Black. It's a really nice finish for dash parts. <<< Since part of the new AC unit sticks out below the dash into the passenger footwell, I needed to trim this plastic kick panel a little. <<< Just a little trimming was needed. Some sheet metal shears performed very well. NOTE: Apparently my setup has the new AC unit a little further from the firewall than Michael's installation. I found I had some glove box interferrence. 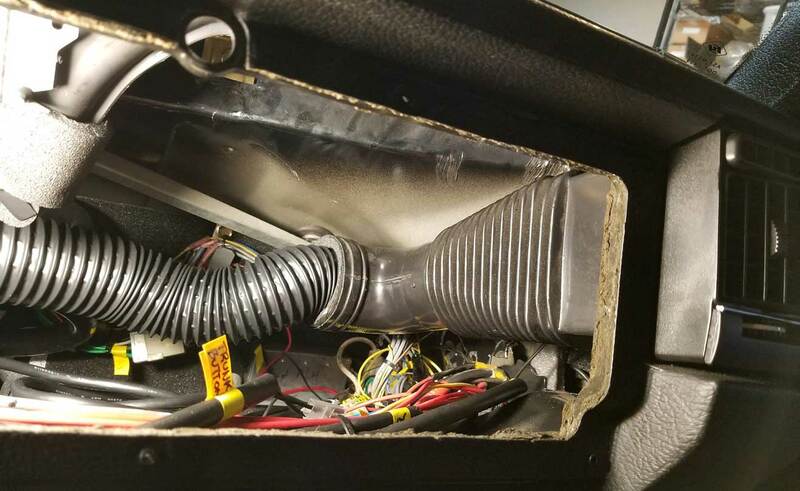 The back left corner of the glove box was touching a refrigerant fitting and it was preventing the glove box from going all the way in. I solved this by trimming a small part off the back left corner of the glovebox and then everything fit again. Moving the new AC unit closer to the firewall would probably have solved this glove box problem, but for my installation it was not possible because the heater hoses coming through the driver's side firewall near the accellerator pedal interferred and kept the AC unit from being pushed farther forward. Michael Yount's installation was different because his heater hoses came through the firewall on the PASSENGER side (for his Chevy LS motor) and apparently this helped with the new AC box positioning. 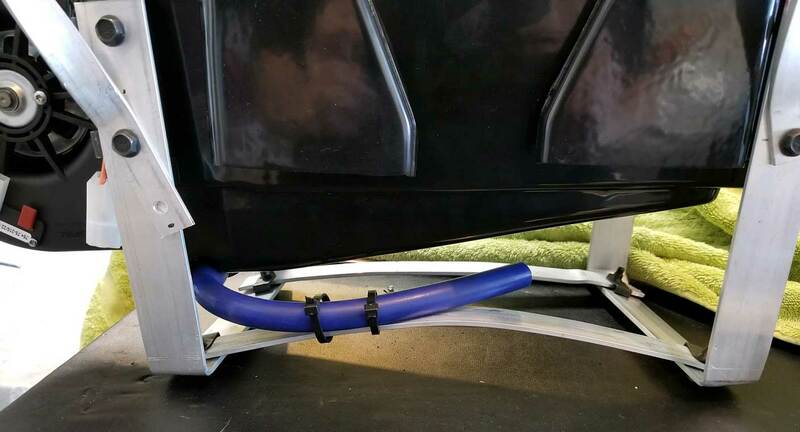 Moving m AC box closer to the firewall was not possible unless I moved it more to the right side, away from the heater hoses, but that would have exposed more of the AC box to the passenger footwell. <<< Here's the completed result. 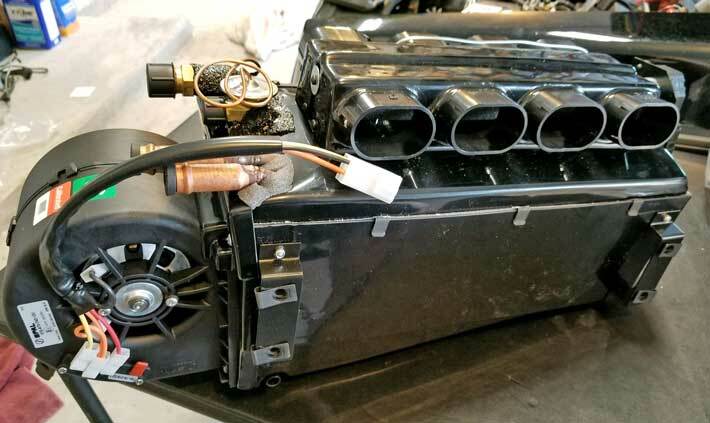 Classic Auto Air has some specific instructions for charging a Street Rod Cooler III. 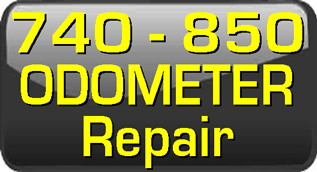 Place vacuum on the system for 30-45 minutes to eliminate all moisture. Vacuum is best at 28-30 inches Hg. I use an electric vacuum pump. It's a good investment if you are doing your own AC work. Classic Auto Air says R134a is required. Substitutes are not recommended. I don't always follow rules. You'll see in my observations below. Recommended charge: 24 ounces of R134a. That's 24 maximum. Do not overcharge. Classic Auto Air says it's better to slightly undercharge rather than overcharge. I was told expected low side pressures should be about 15 to 25 PSI. 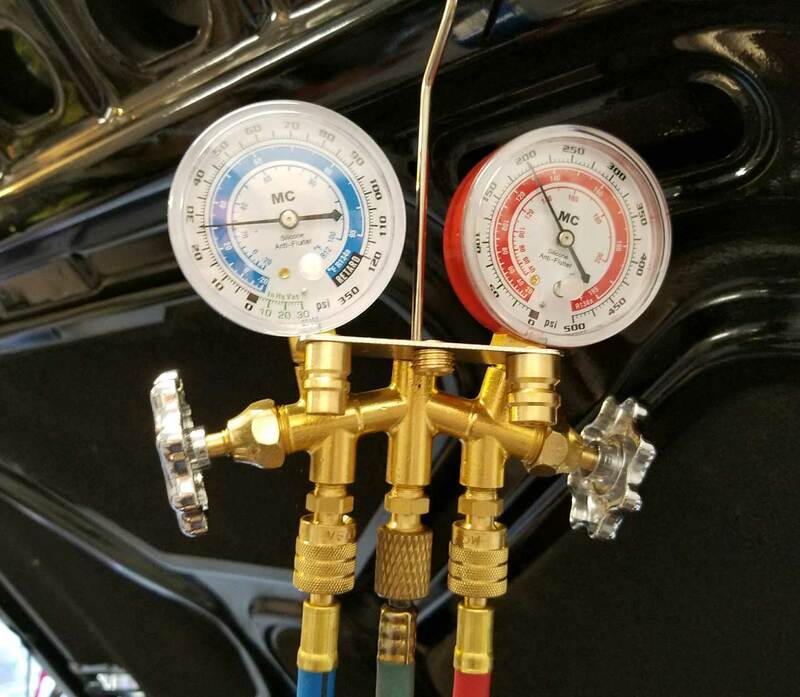 High side pressure is generally expected to be about 150 to 250 PSI. Why do I need to vacuum the system? Air conditioning systems don't like air. Air doesn't harm the system, but it's a lousy refrigerant, so you need to get it out of the system. Air conditioning systems don't like moisture either. Moisture attacks metal parts and will eventually cause the compressor valves and rings to fail. That's the main reason systems sometimes get vacuumed for hours and hours. It's not the air so much as the water vapor that needs to be removed. 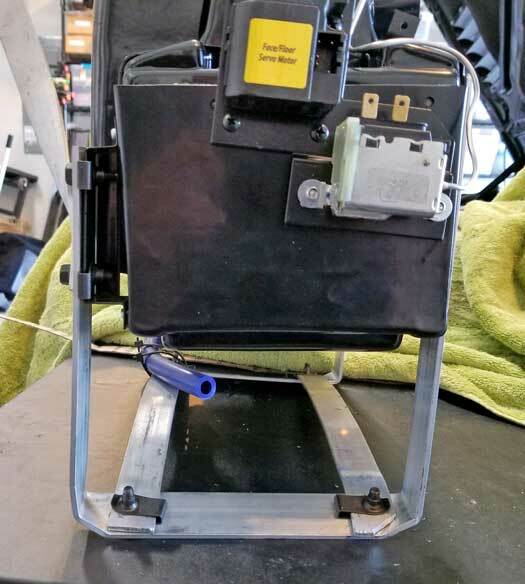 <<< When I began charging with R134a, I set up a postal scale to accurately measure the charge. I got 11.8 ounces out of the first can. To speed things up, a good trick is to place the can in warm water. Not too hot. If it's too hot to touch, it's too hot. This trick raises the pressure in the can so it flows a little faster. It took about 15 minutes for the first can. <<< Some of the water in the bowl turned to ice on can #1. <<< Here's my pressure readings after can #1. R134a Low: 26 PSI. High: 200 PSI. <<< Can #2 took about 20 minutes. Here are the final pressure readings after installing just under 24 ounces. R134a Low: 27 PSI. High: 270 PSI. This is something that will ALWAYS be on your mind when putting such a project together. My system developed a leak somewhere that allowed the refrigerant to leak down in 24 hours. That's a pretty fast leak. It makes you doubt the parts you spent a fortune on, your tools and your sanity. 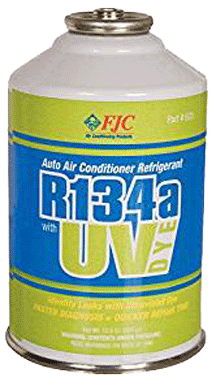 <<< So I bought a can of R134a with UV dye and a UV flashlight on Amazon. <<< Found it! I could see the UV dye leaking up through the threads on this firewall fitting. 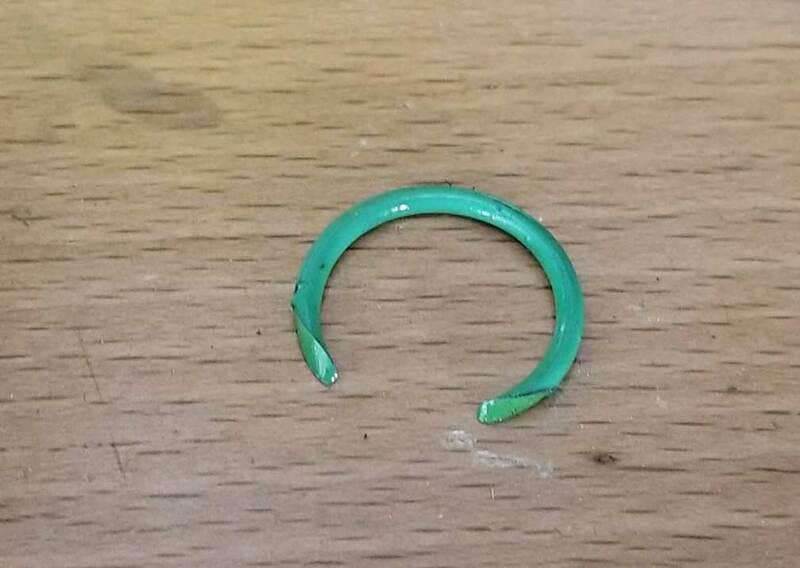 <<< It turned out to be a cut o-ring that was not installed correctly. One must be more careful when coupling these fitting together. Internet sources suggest a bad o-ring causes most leaks in AC systems. 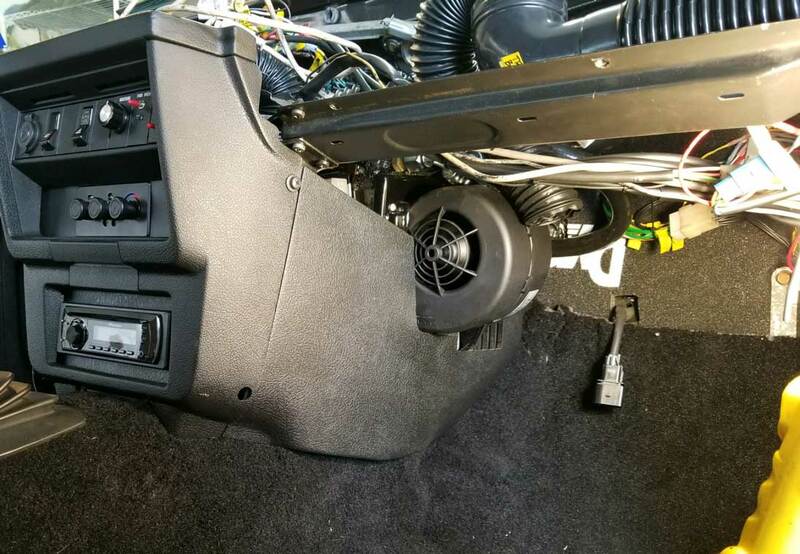 The air turbine in this new AC unit is smaller than those in original Volvo 240 air boxes. That was easy to see since the new unit is more compact than the Volvo box. So I expected the airflow on HIGH setting would not be as powerfull as the original unit and I was right. I can't offer a more precise quantification. If this is a dealbreaker for you, then you should keep your original system. Clasic Auto Air specifies to use R134a. I've never been a fan of R134a. It was never as efficient as R12. But I did give it a good try for a number of weeks. I spent a couple weeks testing with R134a. With R134a I was getting IDLE vent temps of 50 degrees Fahrenheit with an ambient temp of 90 degrees. Running at highway speeds did bring the vent temps down a few degrees to as low as 46 degrees. This did offer reasonably comfortable driving, but it was NOT making me smile. I decided I spent too much money to not get a smile out of this! I've been a fan of Duracool for a number of years. http://www.duracool.com/. Read their FAQ section. Duracool is advertised to be 35% to 40% more efficient than R134a (it's similar to the efficiency of R12). It produces significantly lower head pressures than R134a. R134a pressures seen for this installation: 27 PSI low, 270 PSI high. Duracool pressures: 14 PSI low, 125 PSI high. LESS DURACOOL IS REQUIRED COMPARED TO R134a (or R12a). 24 ounces of R134a was required for this setup. The Duracool equivalent is 10 ounces. Yes, 10 ounces. Here's a chart below showing exact conversions (also found in the Duracool site FAQ section). A bit more generic info about Duracool. Duracool can be purchased in any quantity without a fluorocarbon HVAC license (so can R134a, except in large cannisters). Since Duracool is a hydrocarbon and not a fluorocarbon, it is 100% compatible with all lubricants used in R12 and R134a systems. All lubricants. 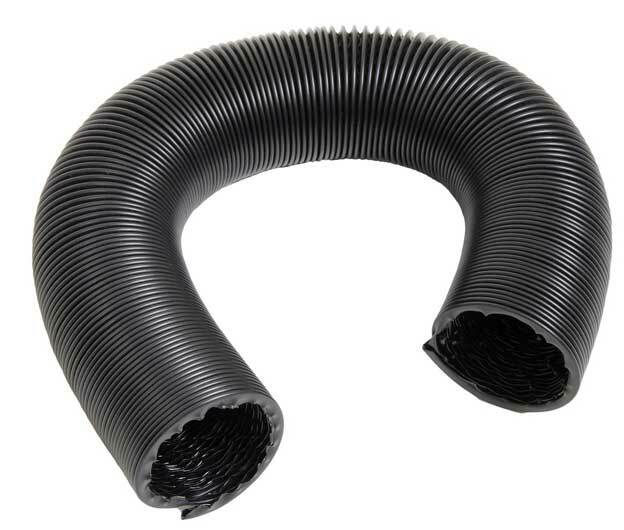 It's also compatible with all elastomers used in refrigeration O-ring seals, hose linings, etc. Duracool is non-toxic (as opposed to R134a), it does not negatively affect the environment or ozone (as opposed to R134a), and it doesn't produce deadly phospene gas if exposed to a flame (as opposed to R134a). Duracool isn't illegal to buy or to put in your car (some people think it is and Dupont would like it to be). 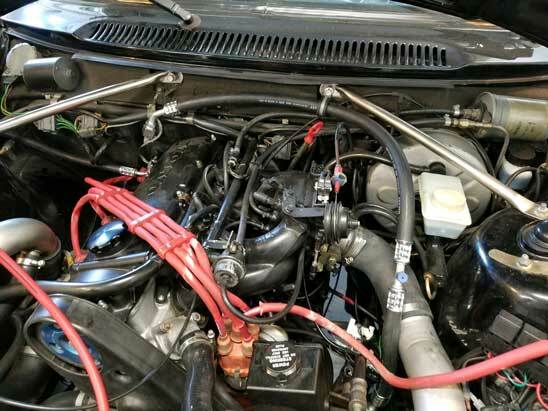 It's just hard to find an AC shop who will install Duracool or do any work on a car with Duracool. This is partly because most AC technicians have paid good money for their fluorocarbon licenses and they want to keep the business as proprietary as they can. Also they consider anything but the standard Dupont designed refrigerants to be "contaminants" to their pristine equipment if they hook up to your Duracool infected car. 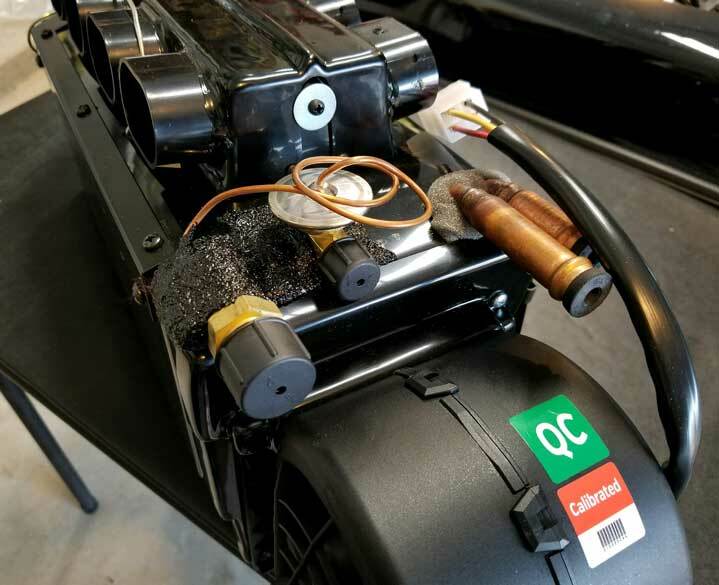 For these reasons, Duracool servicing may make more sense for do-it-yourself AC work only. There are people who actually consider themselves to be intelligent who will be promptly tell you your car will explode in a ball of flames if you use a hydrocarbon refrigerant. They forget that they are driving around with 15 to 20 gallons of highly volatile gasoline, which is pumped through hoses under high pressure. And they worry about a few ounces of hydrocarbon gas. I hope these people never move into a house using propane or natural gas. 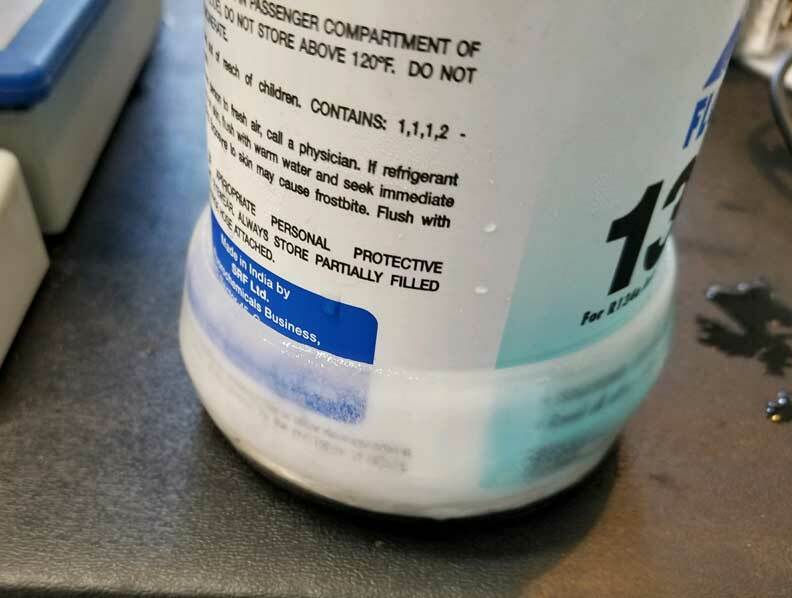 If you read the MSDS information for R134a, you will find something like this: "R-134A is not flammable at ambient temperatures and atmospheric pressure, however, this material will become combustible when mixed with air under pressure and exposed to strong ignition sources." R134a is not as harmless as you might have been told. Testing was done at idle and on the road. <<< IDLE TESTING: With Duracool (while idling) I saw a low vent temperature of 27º Fahrenheit with an ambient temperature of 80º F (not very hot, but by this time summer was gone and cooler fall temperatures were here). This temperature was recorded at idle in my garage with the fan on the lowest setting. As the AC continued to cycled on and off, the vent temperature ranged between 27º and 32º F. Increasing the fan speed tends to bring this vent temperature up a few degrees because more warm air is being pushed through the evaporator. 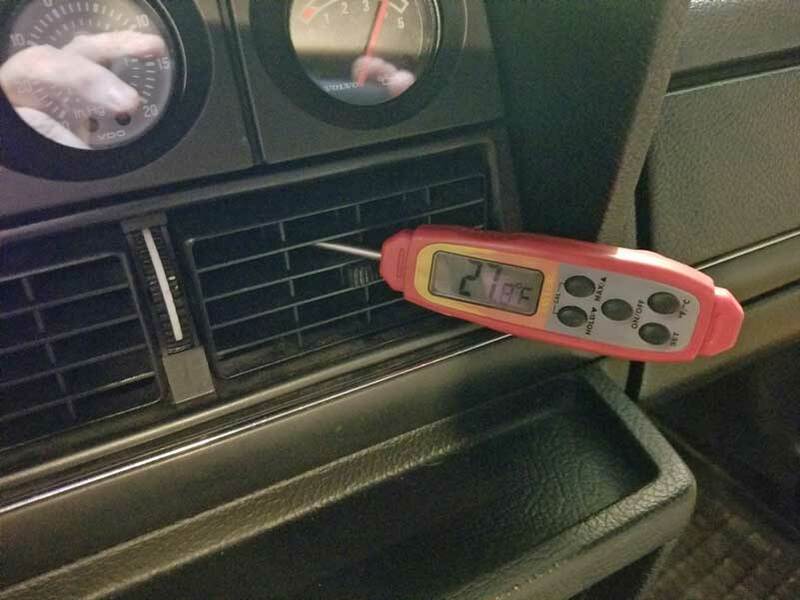 When summer 2018 came along, I did more testing with ambient temperatures of more than 100º F. Vent temperature at idle in my garage was 46º F.
Since 46º F felt pretty good with that kind of outside temperature, I was curious about my wife's new Subaru Forester. So I tested the Subaru AT IDLE with the same 100º F plus outside temperature. It recorded a vent temperature of 43º F. The old 240 wasn't too far behind that. 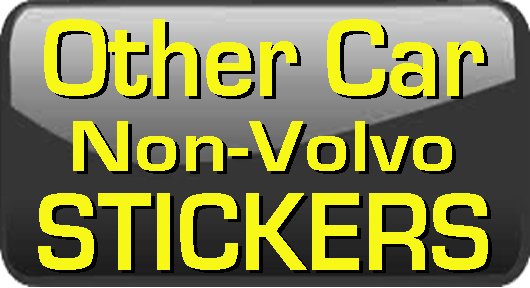 ROAD TESTING: While road testing the Volvo at 55 mph, I saw a low vent temperature of 31-32º F with an outside temperature of 105º F.
NET TEMPERATURE DROPS: So it appears my vent temperature drop below ambient is around 53º-55º F at idle and around 68º-74º F degrees at 55 mph. This is awesome cooling compared to before! Yes, this makes me smile. If you have done an AC upgrade to your Volvo or if you're thinking of doing something like this in a Volvo (any Volvo), please email me. I'd like to hear all about it.